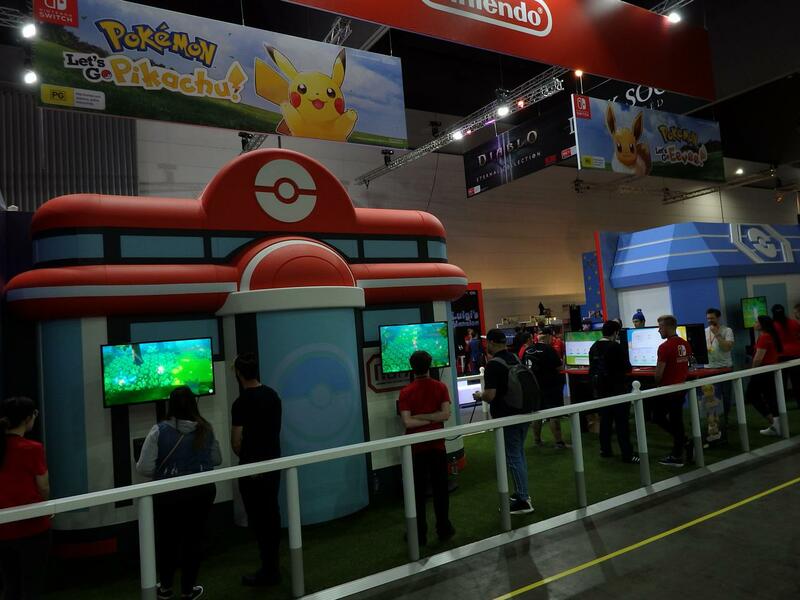 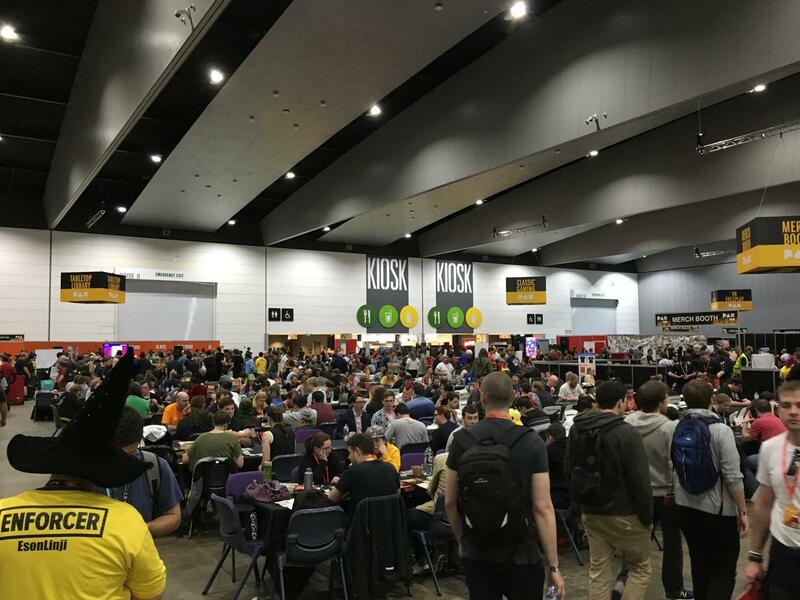 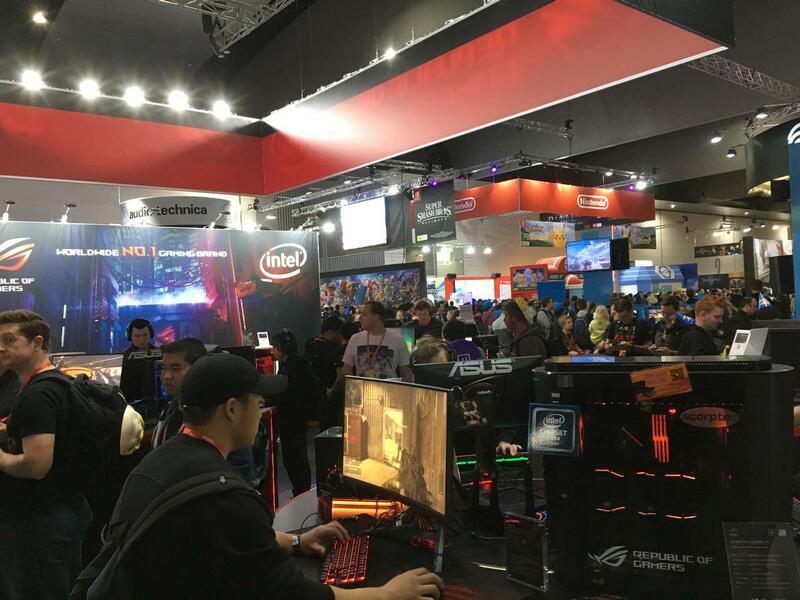 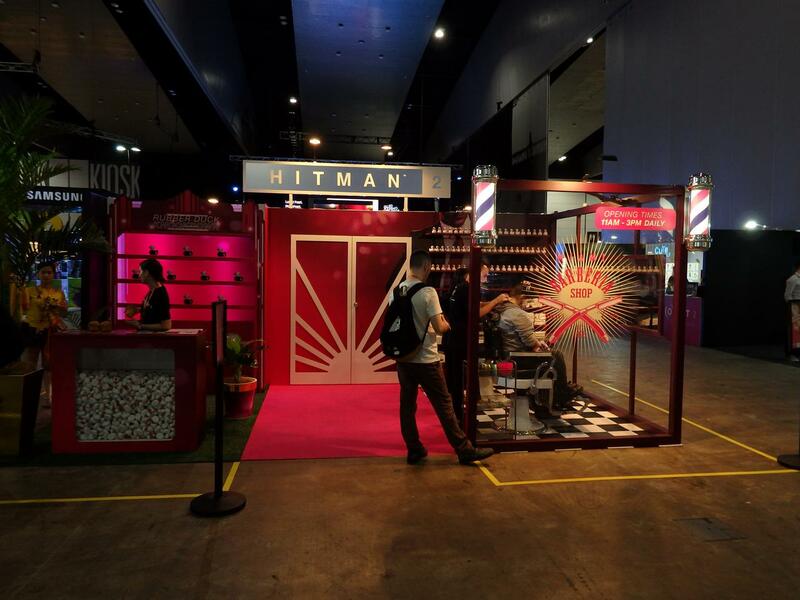 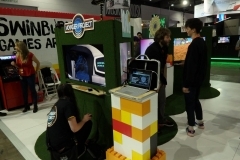 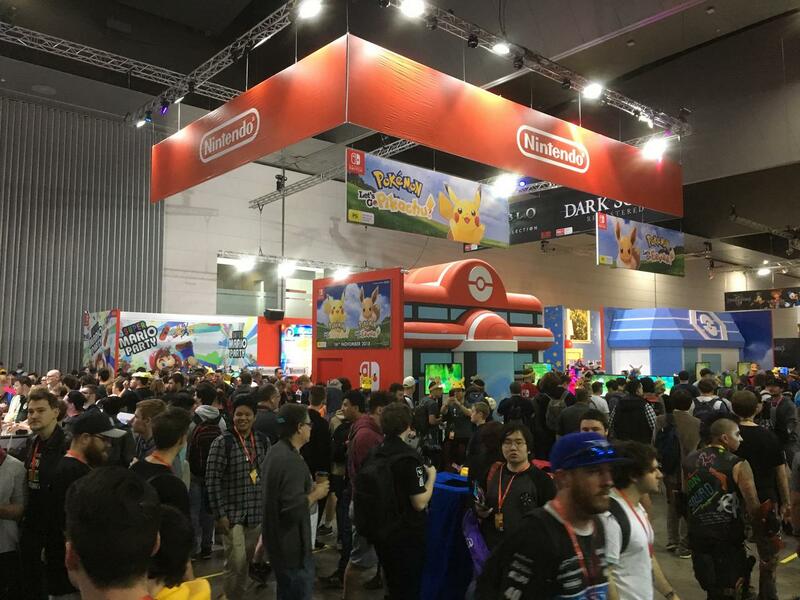 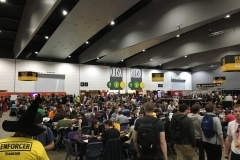 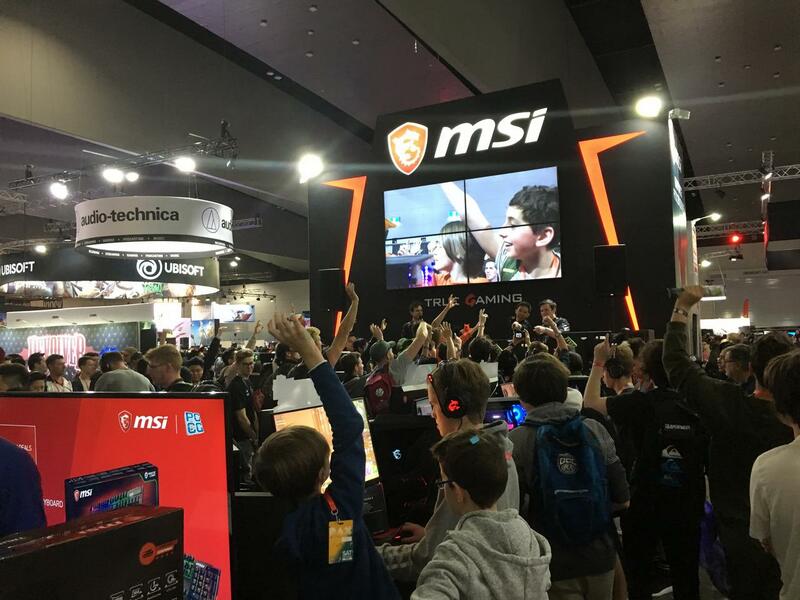 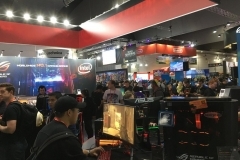 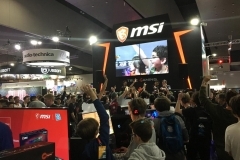 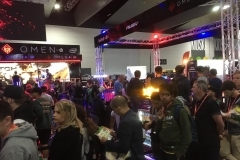 PAX 2018 hit Melbourne, starting 26th October and running for three days at the Melbourne Convention and Exhibition Centre in South Wharf. 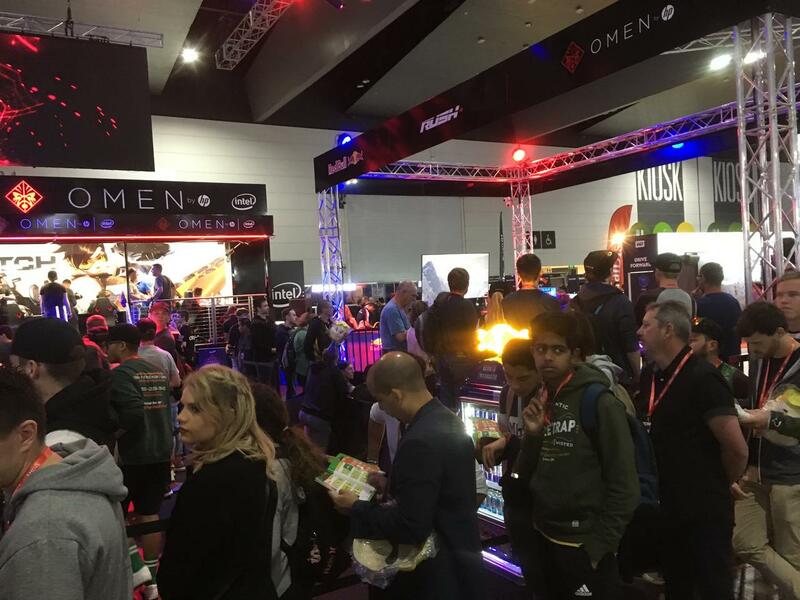 The event was once again successful for all involved with a diverse range of exhibits providing access to products and knowledgeable people. 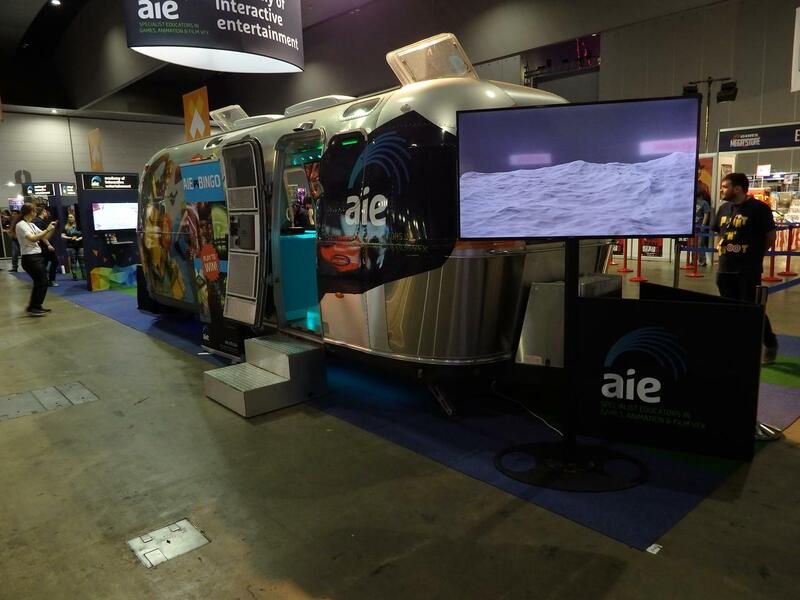 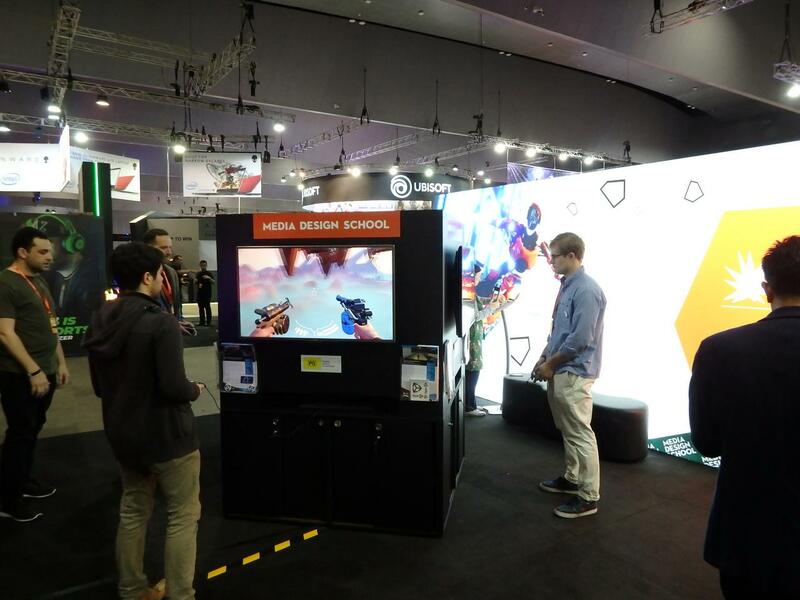 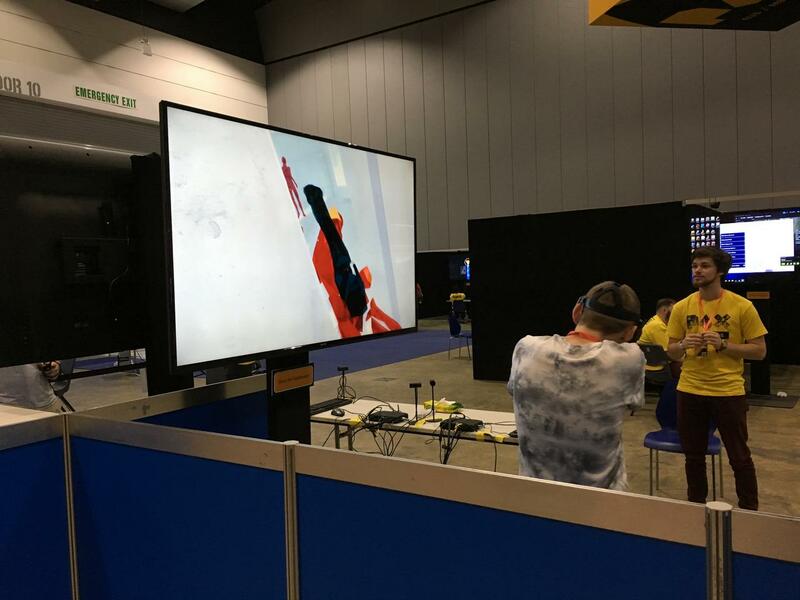 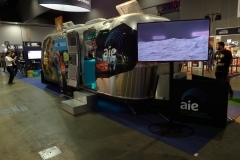 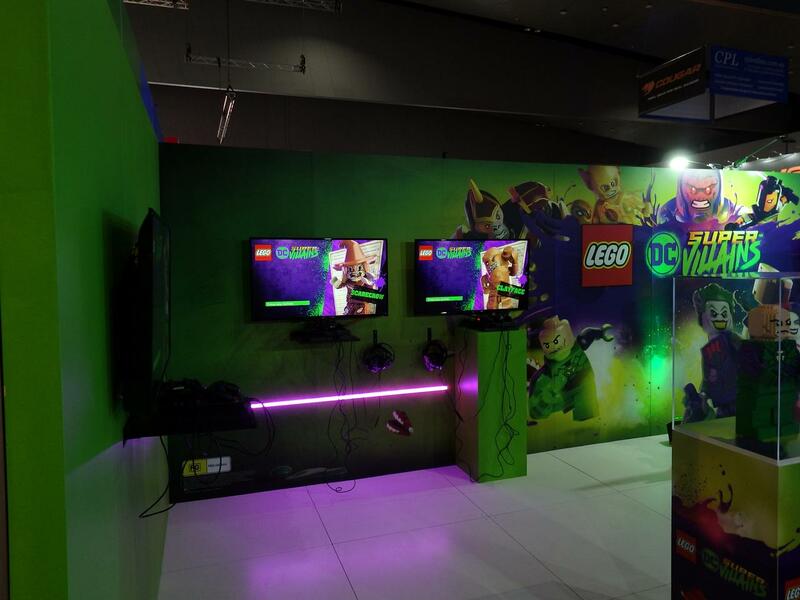 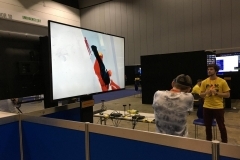 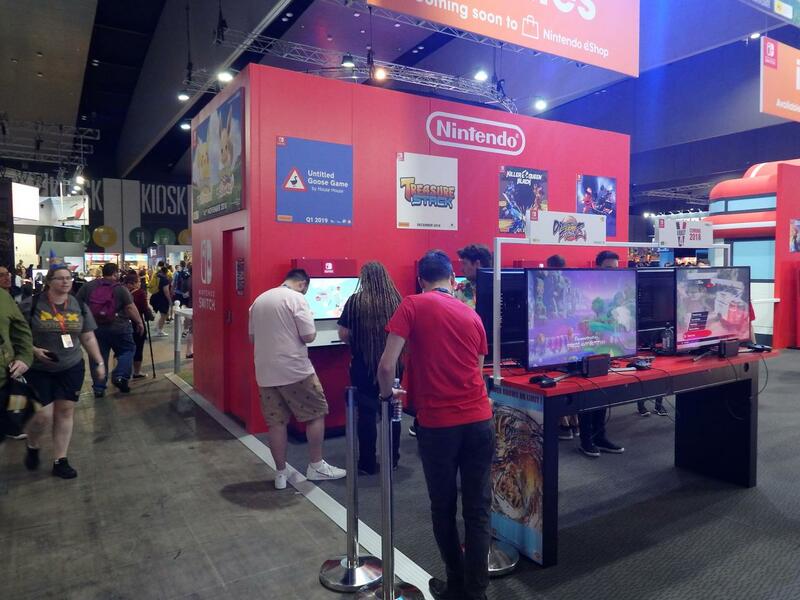 This collection of intellectual property and product demonstrations only happens once a year in the APAC region so yes, this is a big thing.Media were admitted to the event an hour early on the Friday so if any of the photos look a little quiet, they were taken before the general public were let in – PAX 2018 was just as busy as previous years. 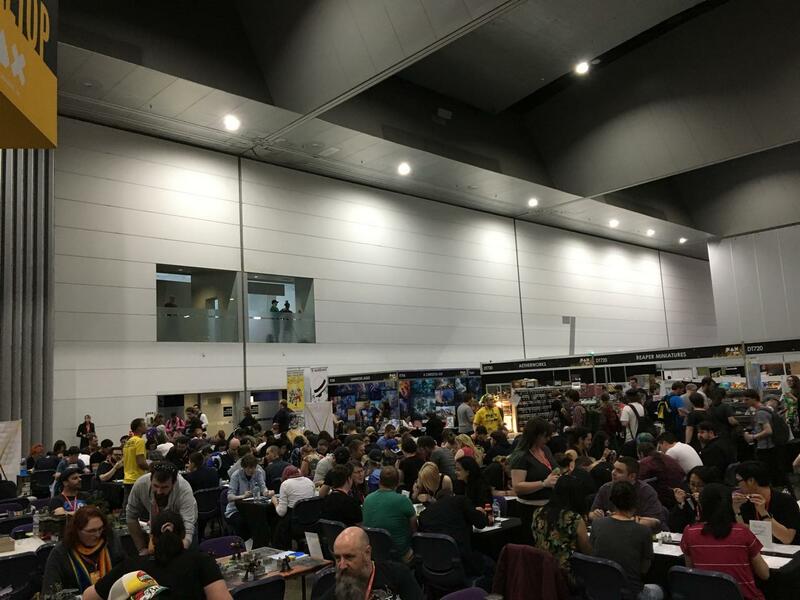 Cosplay is also a big theme and adds to the ‘fun’ part of the event – some costumes are very basic whilst others are absolutely amazing and whilst many fall in-between, they are all creative and good to see. 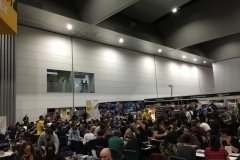 The access to entertainment can’t be understated – this is the place to try out that game you have wondered about or even talk to a person who knows a lot about it (in some cases they might be an attendee, not a vendor rep). 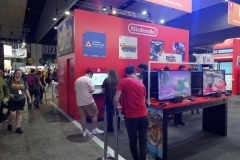 As a PC user, I found myself impressed and seriously tempted by the Nintendo Switch this year when I wasn’t really attracted to it previously. 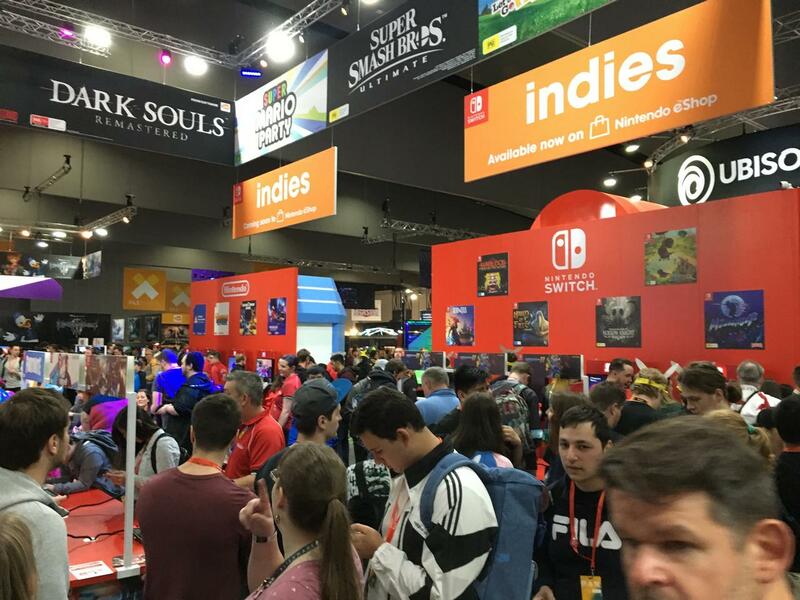 The Switch was a lot of fun to play and I really enjoyed the time I spent with it at PAX which highlighted the underlying purpose of the event to me – check out something different and have a go. 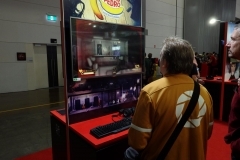 Pete Hines [Senior Vice President – Global Marketing and Communications, Bethesda Softworks]. 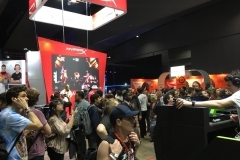 We couldn’t have asked for a more interesting group of people and the audience was hanging on every word in what was a completely packed theatre. 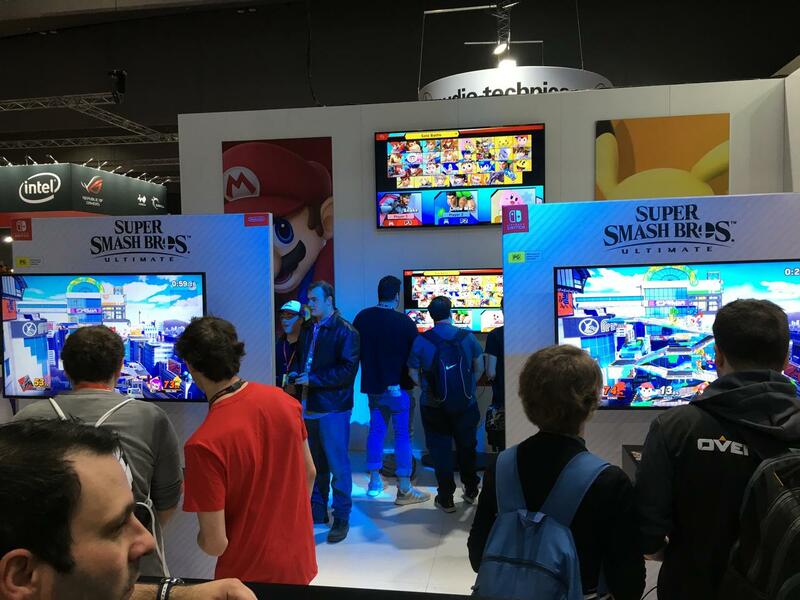 It was worth lining up half an hour early to get a seat. 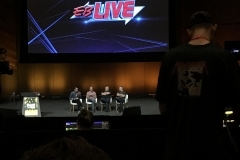 The panel talked about how they came to be at Bethesda, what motivates them and gave an insight into why they have been working together at Bethesda for so long. 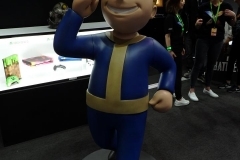 It’s no accident that Bethesda is so successful with grounded yet passionate people like these running the show. 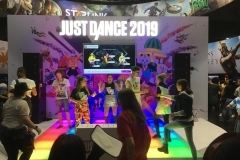 They each also talked about games they worked on that were never released but there didn’t seem to be any frustration in the tales, just a learning and then focus on the next project. 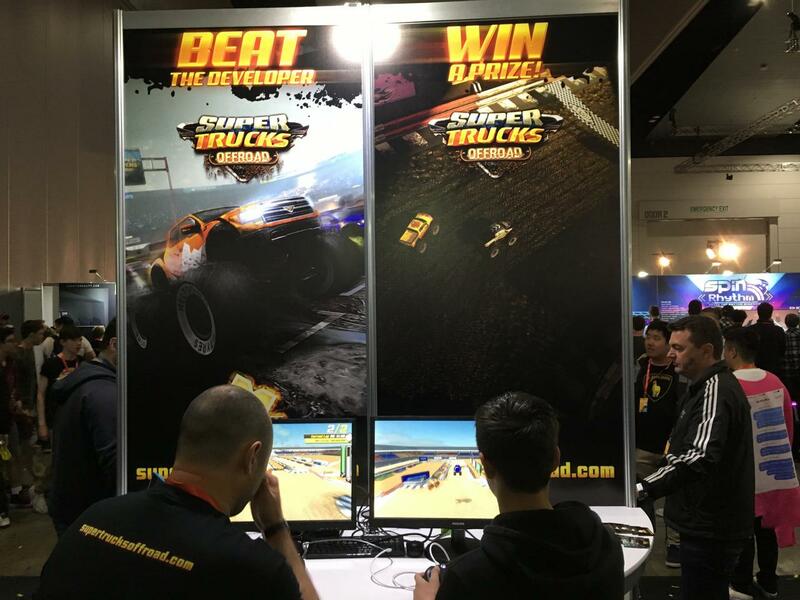 Matt, Tim and Pete all presented with drive and amazing self belief but still seemed very down to earth at the same time. 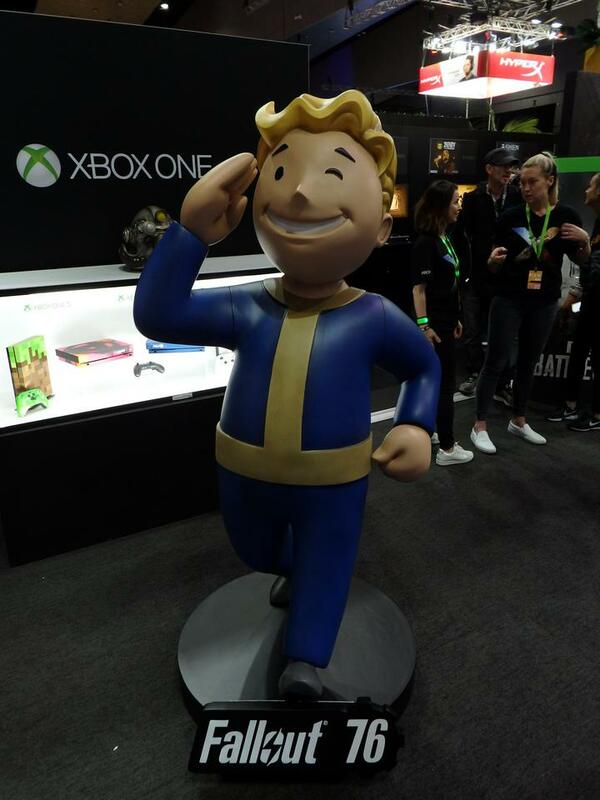 The experience on that panel and in the teams that they lead are clearly the strength of Bethesda. 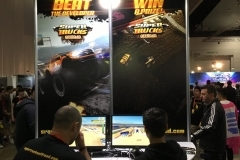 Matt Firor said that unlike the past where developers were fighting both technology (eg. 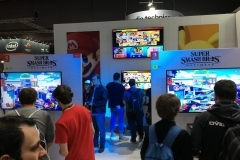 multiplayer networking challenges) and game design, now the challenges were more about the higher expectations of the community regarding level design, content and game mechanics. 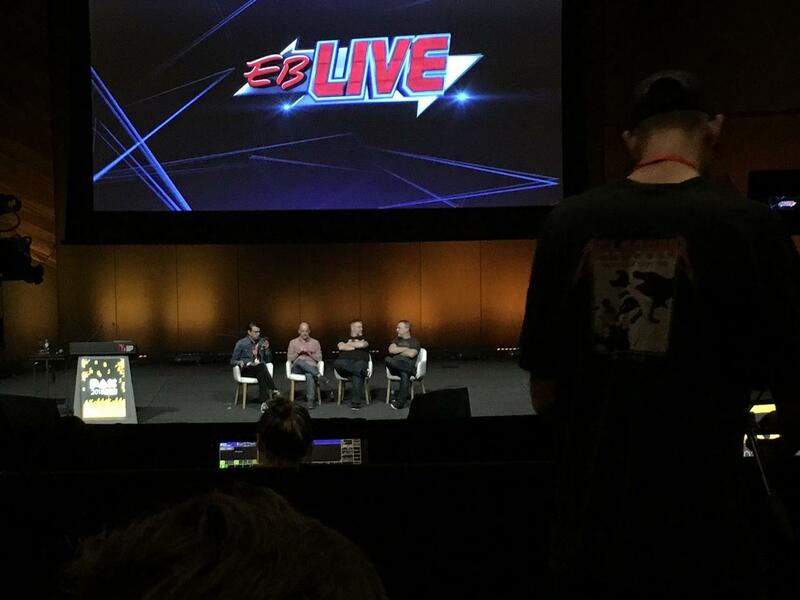 In the context of Elder Scrolls Online, this insight resonates and explains why the game is such a strong title. 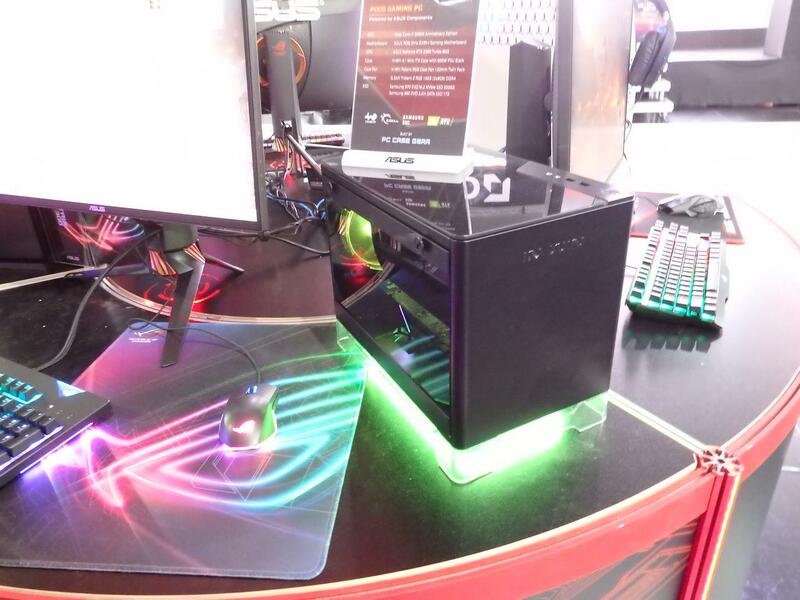 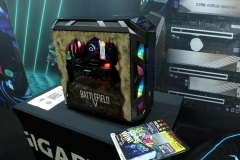 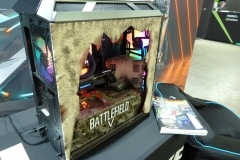 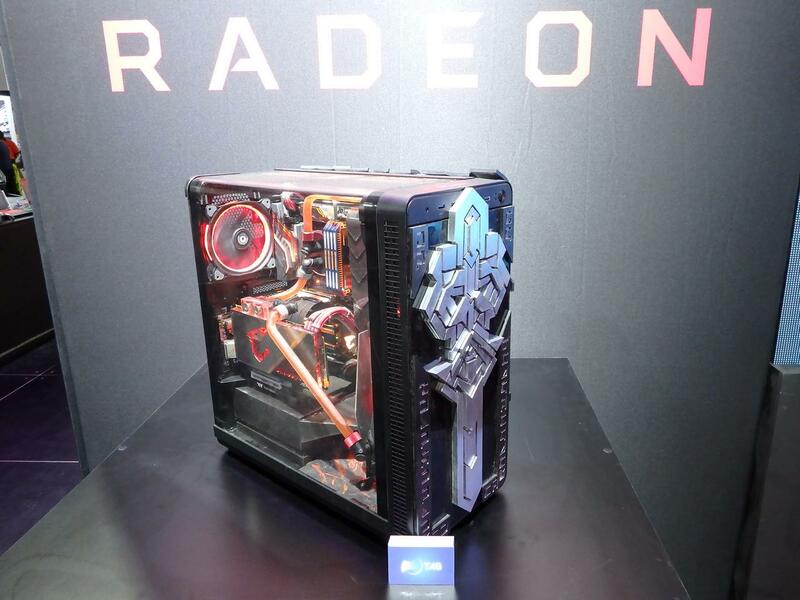 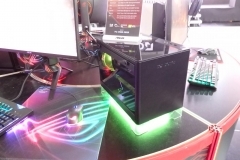 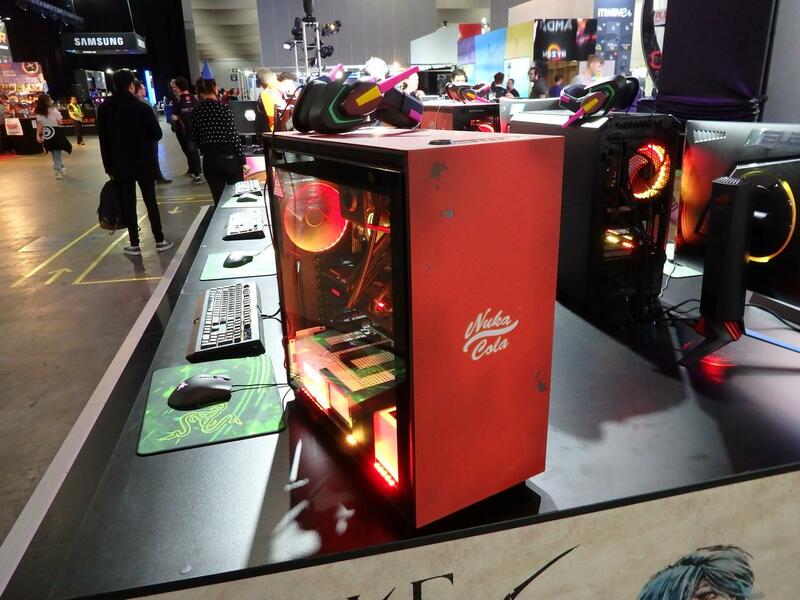 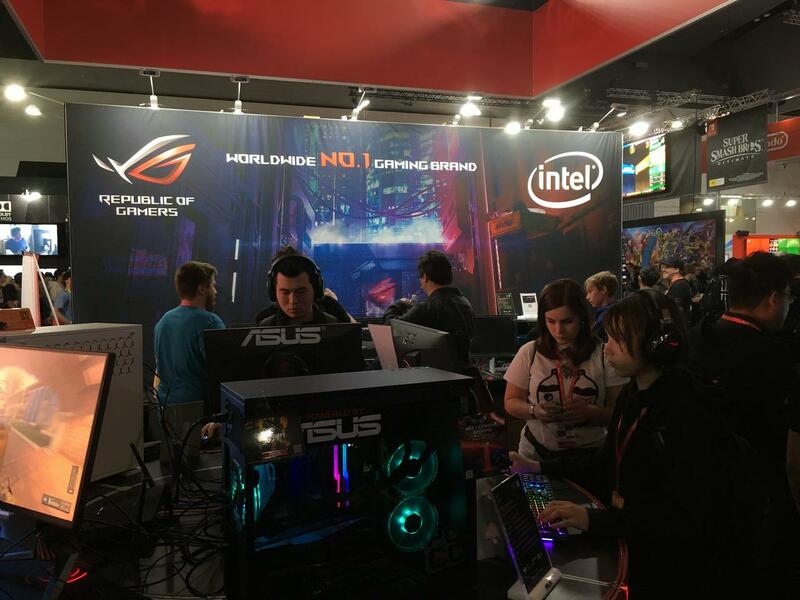 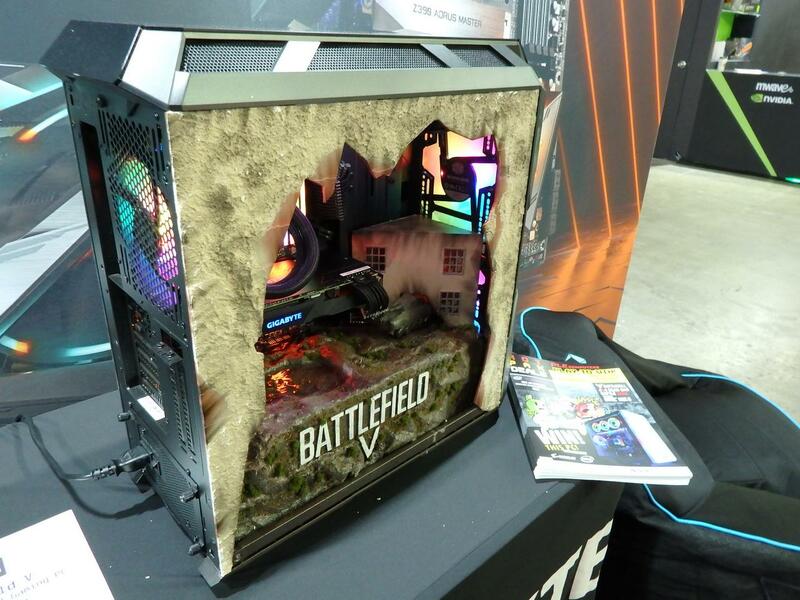 In Win collaborated with ASUS at the booth and the cases looked great. 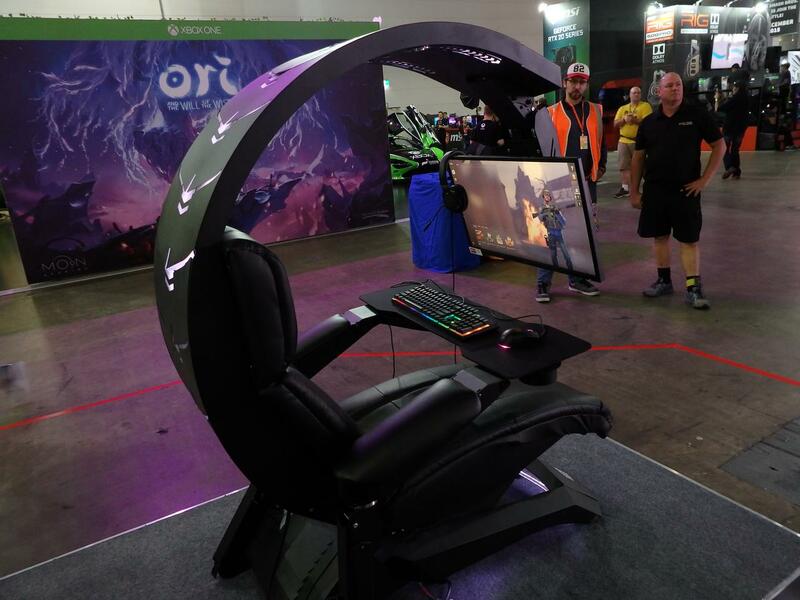 Circular display benches made it easy to get around the systems and check out the ROG peripherals and monitors available to the masses. 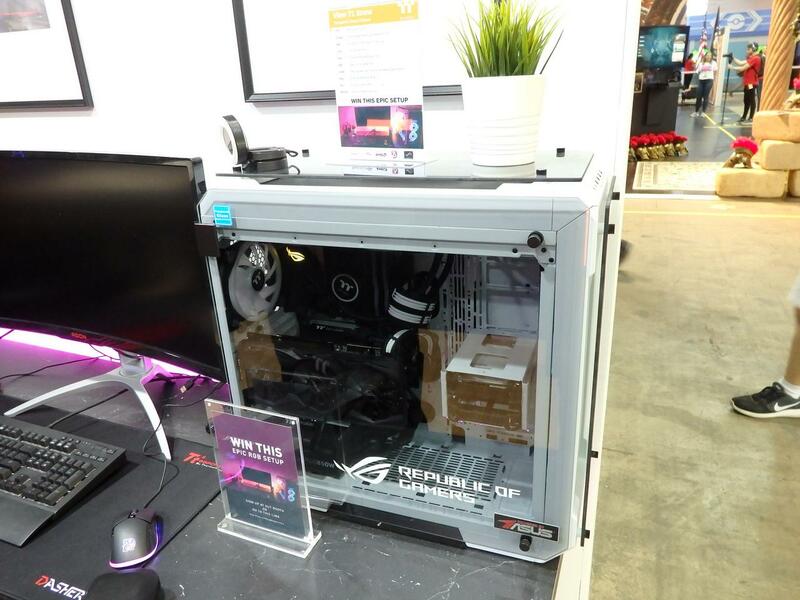 ASUS products are high-end and seeing them on display at a scale like this doesn’t happen very often. 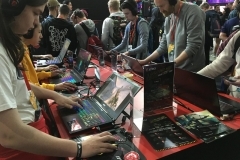 The ASUS demo area felt premium with an impressive combination of products, thoughtful booth layout and most importantly a very knowledgeable team on hand to answer questions or point out key features. 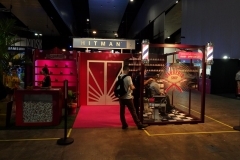 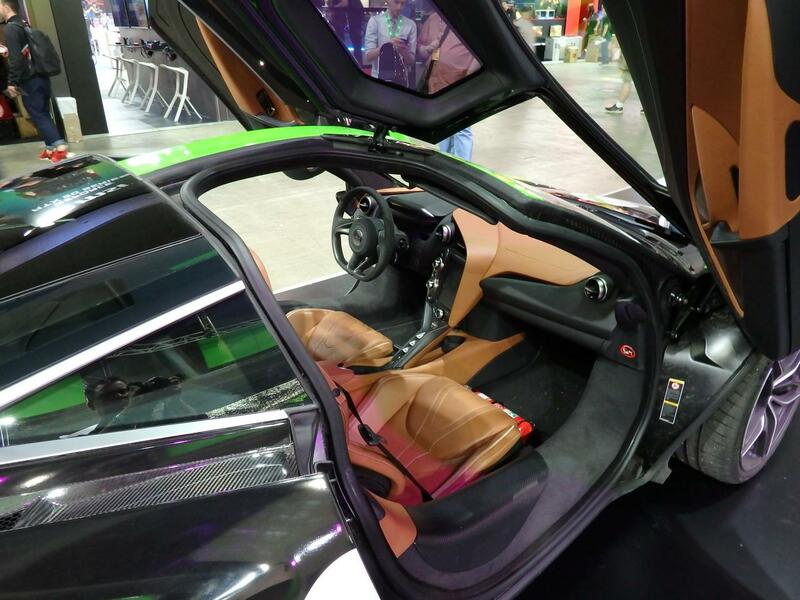 This was a very slick booth to visit. 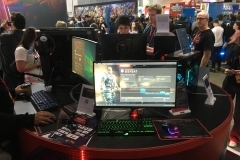 Black Ops 4 was all the rage this year and well represented across the booths. 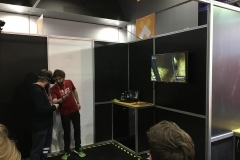 Player feedback was also really positive with the main observation being the increased time to kill. 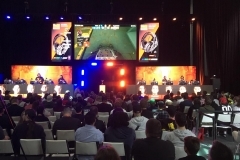 In general, people familiar with Black Ops 2 and 3 felt that they’d need to play Black Ops 4 differently due to the shift in game mechanics but that this wasn’t a bad thing. 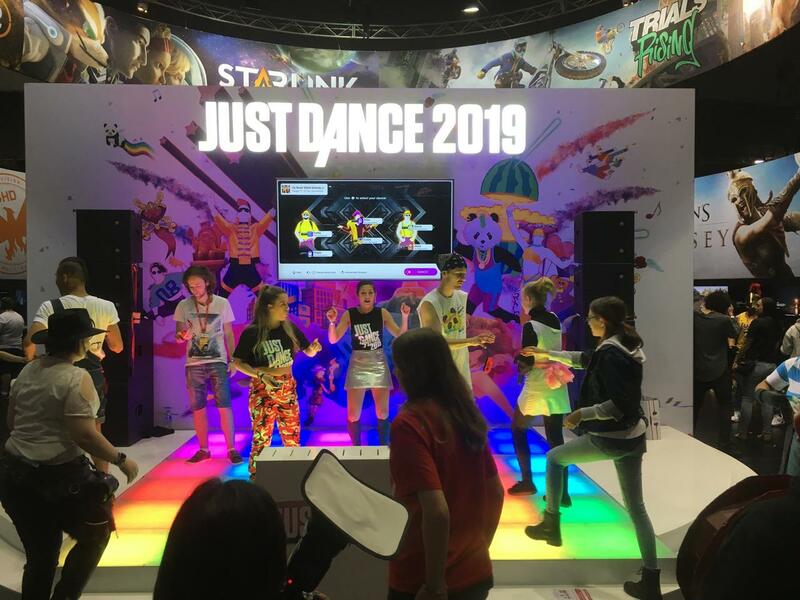 The good news for Activision is that most of the players we spoke to were saying that they’d probably be buying it this year. 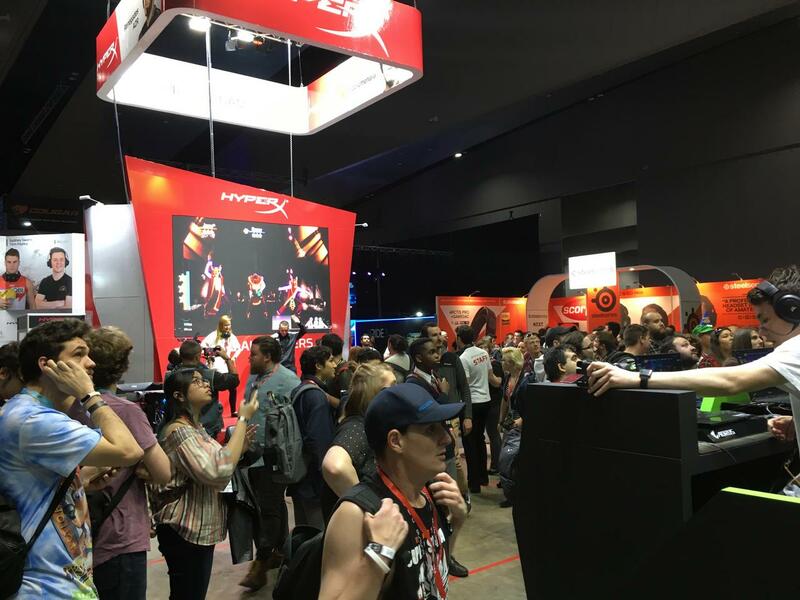 The HyperX booth is another favourite that we like to visit each year with a good range of products to see up close and a non-stop schedule of interactive activities. 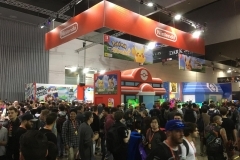 The place was constantly buzzing with energy. 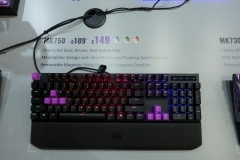 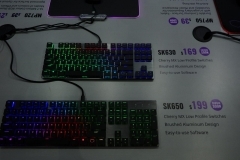 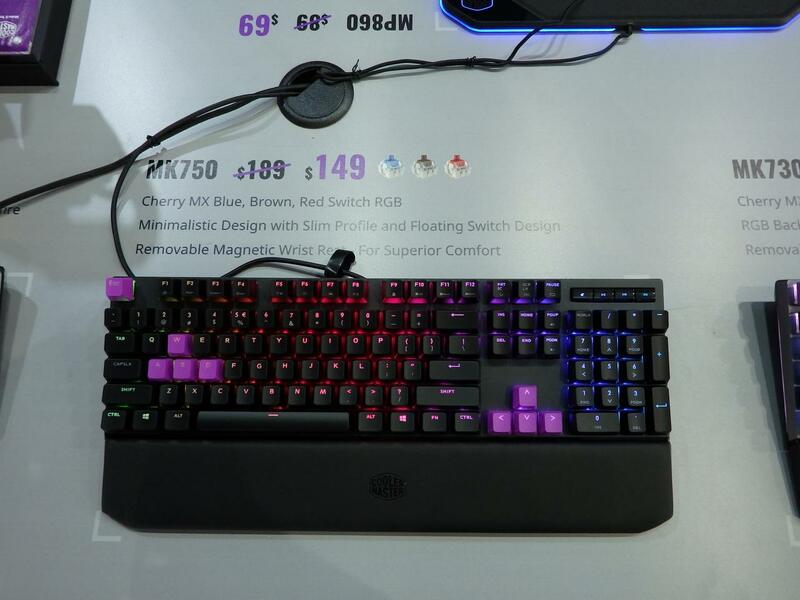 The key products we noted were the new Alloy FPS RGB mechanical keyboard with Kailh silver mechanical switches, a removable USB Cable and solid steel frame. 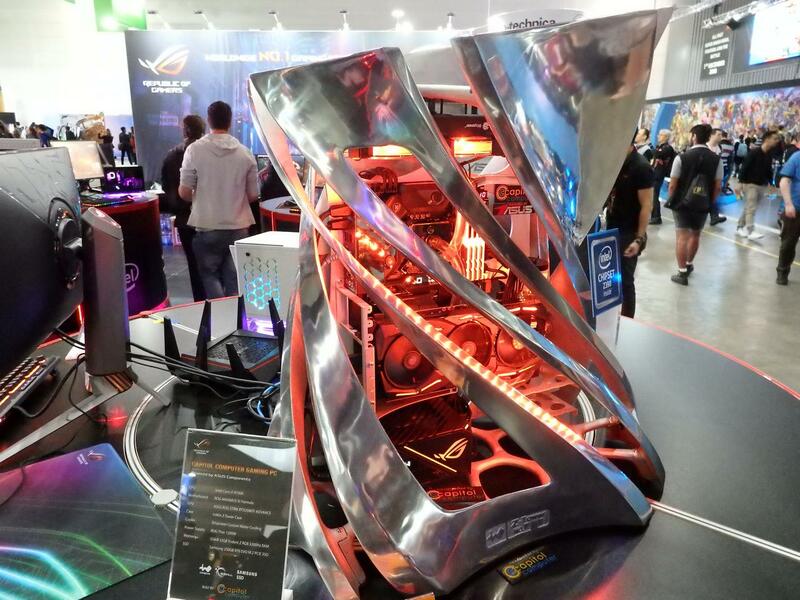 This thing felt “industrial strength” durable but looked sleek and stylish at the same time. 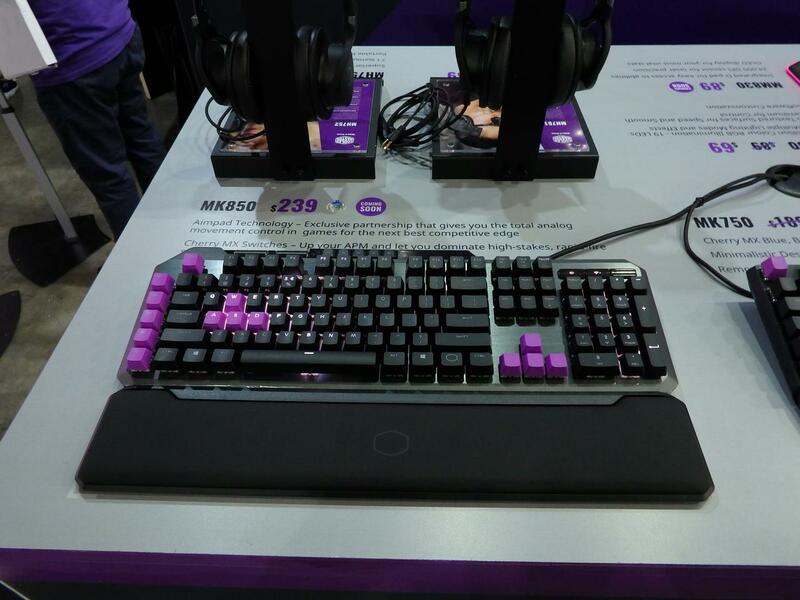 This could very well be the next keyboard I use for my personal system. 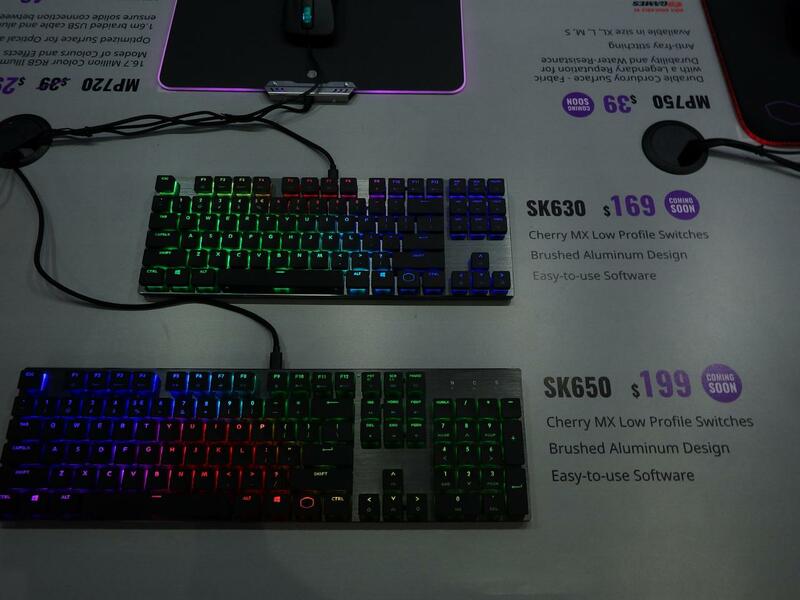 Another keyboard also got our attention, the soon to be released RGB membrane keyboard aimed at the budget market. 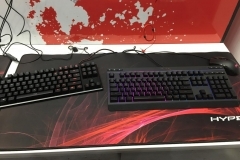 Cost saving aside, one of the benefits of membrane keyboards is that they also make less noise than the mechanical alternative. 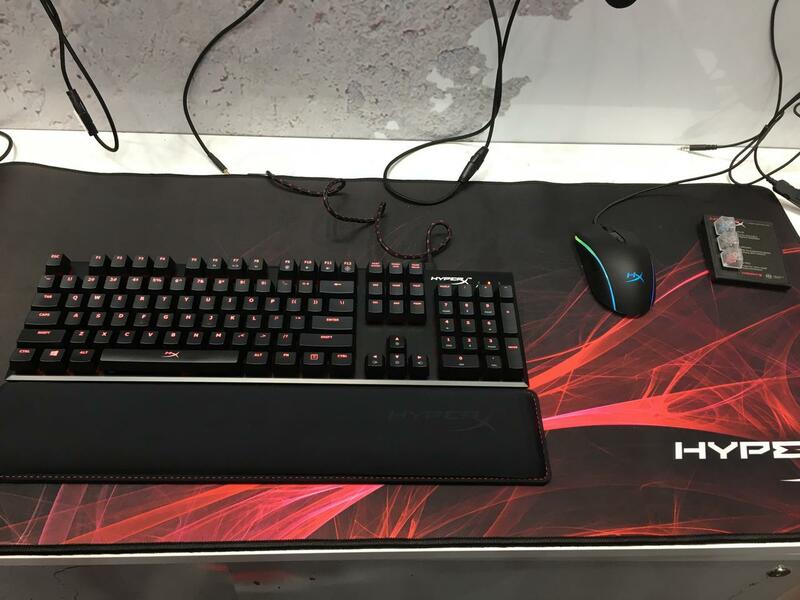 Audio is another area for which HyperX product have developed a strong reputation. 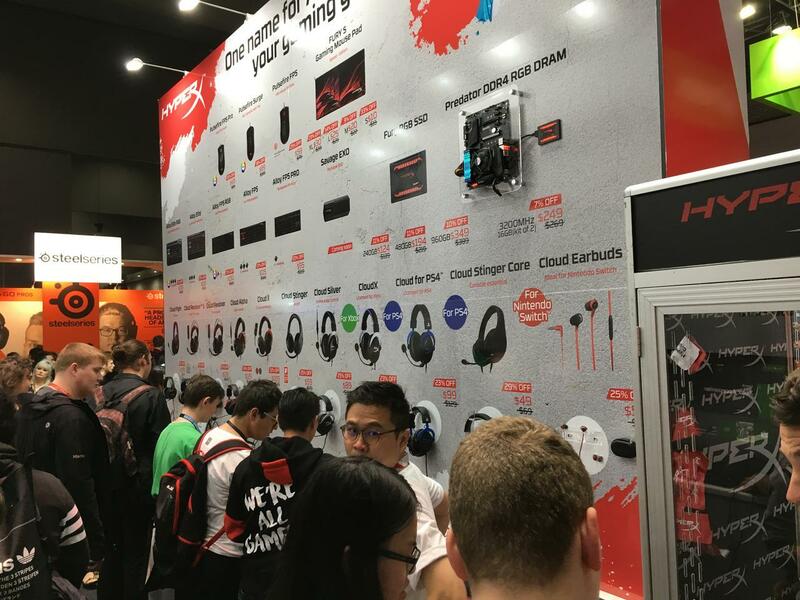 My current headset of choice is the HyperX Cloud Headset and the Cloud Alpha with dual chambers looks like a worthy upgrade. 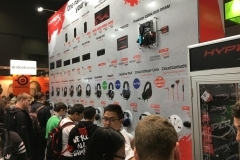 PAX is a noisy and chaotic environment so it’s not the best environment to be checking out audio peripherals but the Cloud Alpha was certainly comfortable and I’ll try to organize a set for review soon. 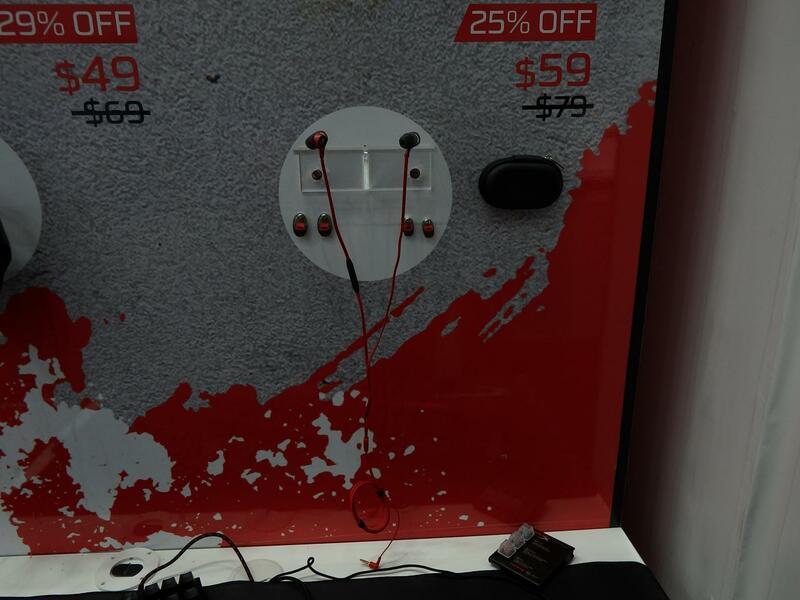 HyperX also released their Nintendo Switch compatible Cloud Earbuds recently and had them on display – this is definitely something Switch owners should look into. 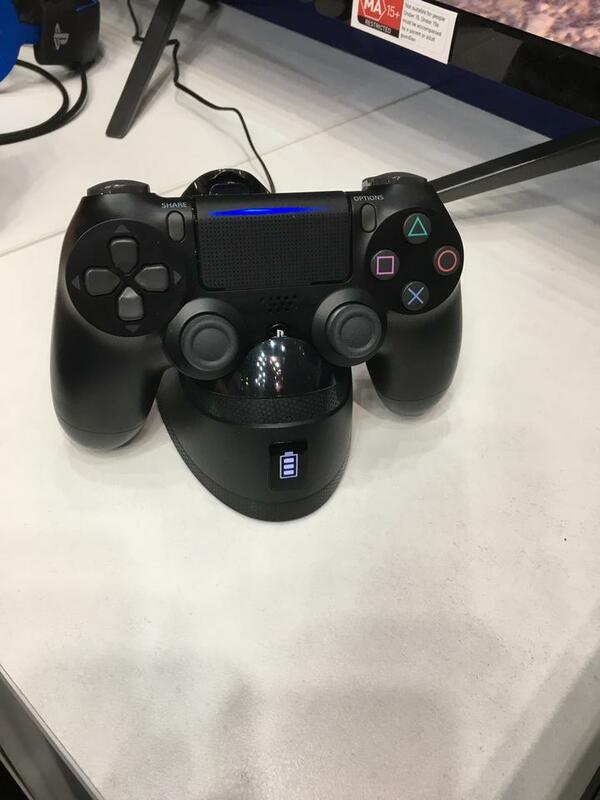 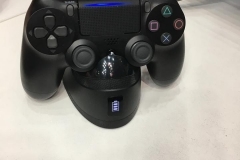 The PS4 controller charger also deserves an honourable mention as a neat way of storing/charging console controllers with a clear indicator of the charge level on the cradle. 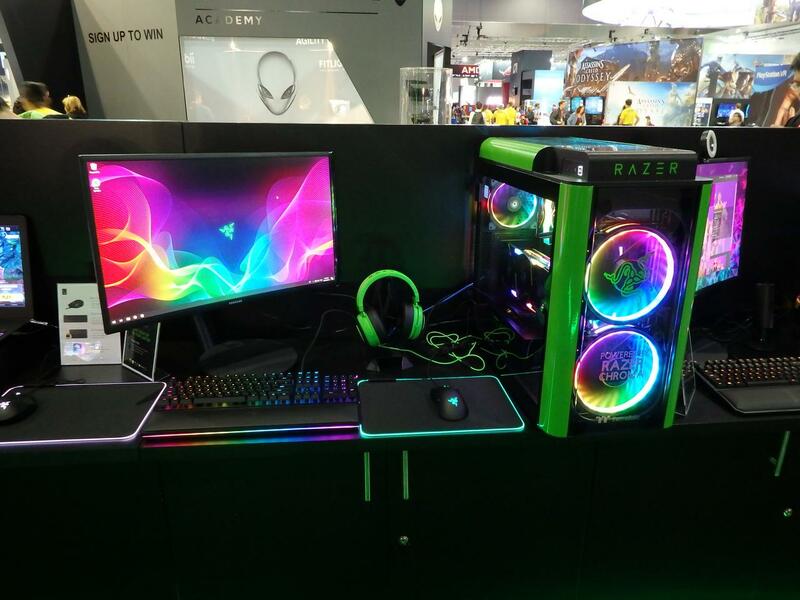 Razer’s booth was as impressive as always with their trademark black and bright green, now mixed in with some RGB. 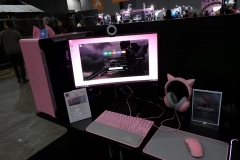 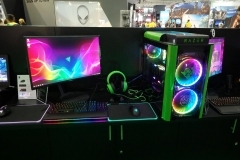 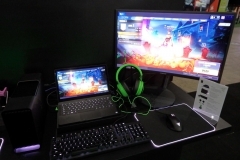 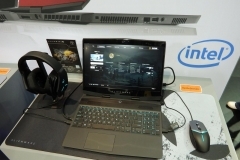 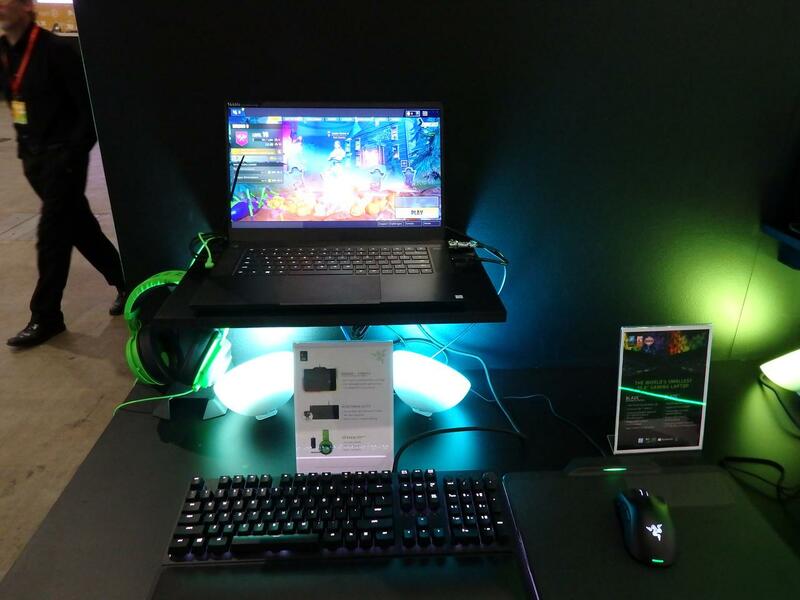 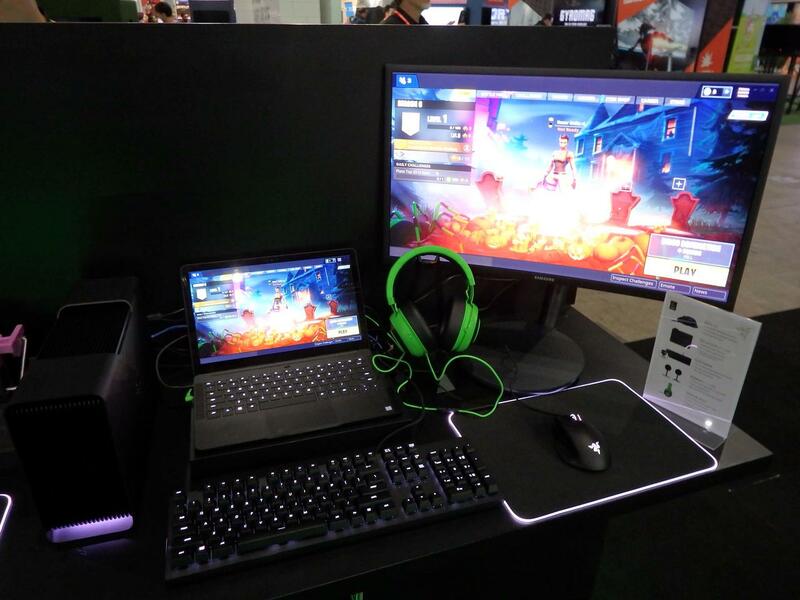 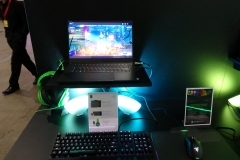 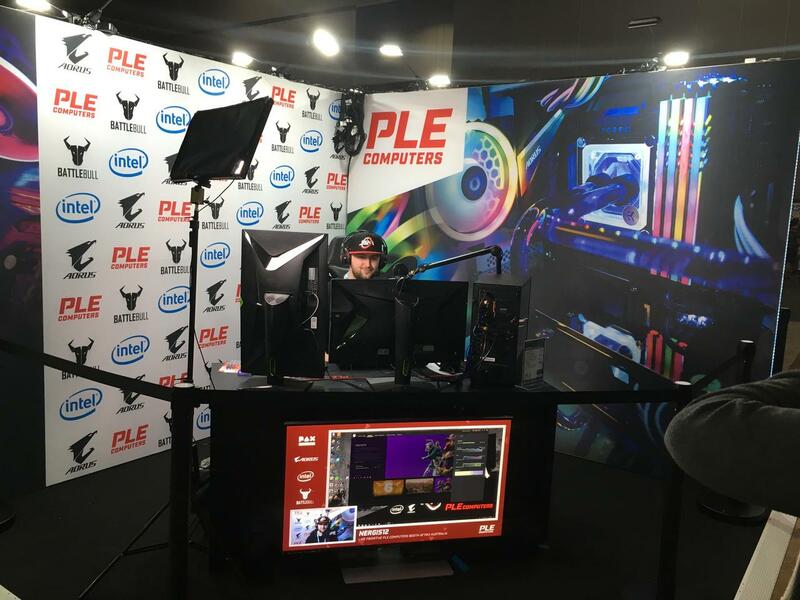 The Blade gaming notebook range was given pride of place with the new Razer Blade 15 as the stand out but there were also a few creative custom PCs available for use with Razer peripherals at the stand. 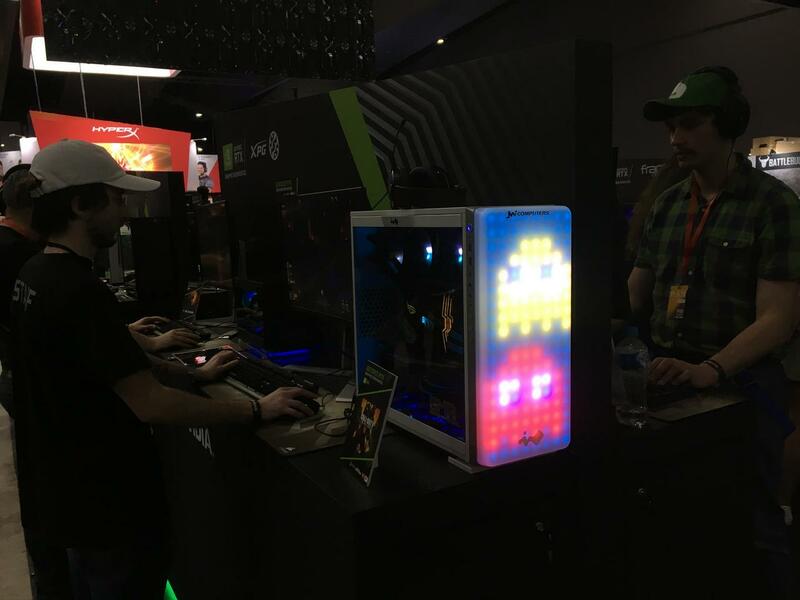 Given the product cost and level of competition in the peripheral market, this opportunity to get hands on and try before you buy at PAX is brilliant. 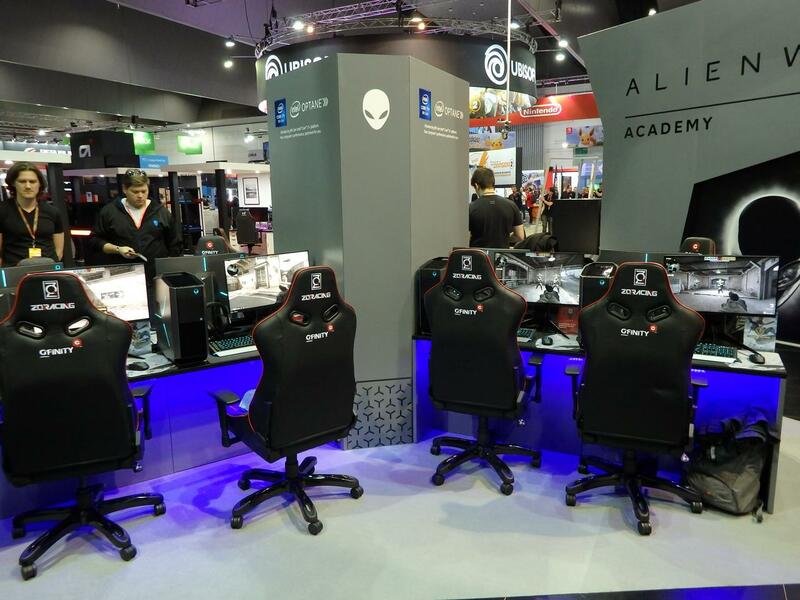 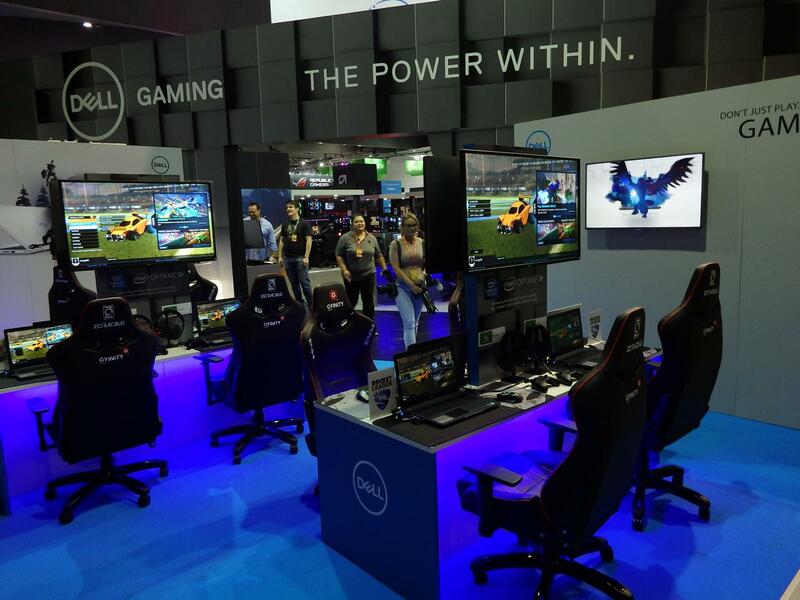 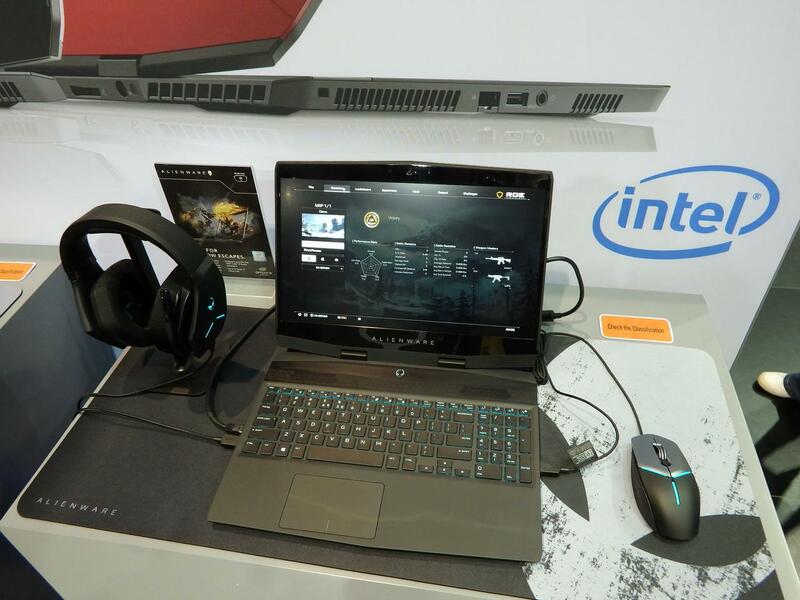 Alienware always have a strong showing with one of the most extensive and professionally presented booths at PAX. 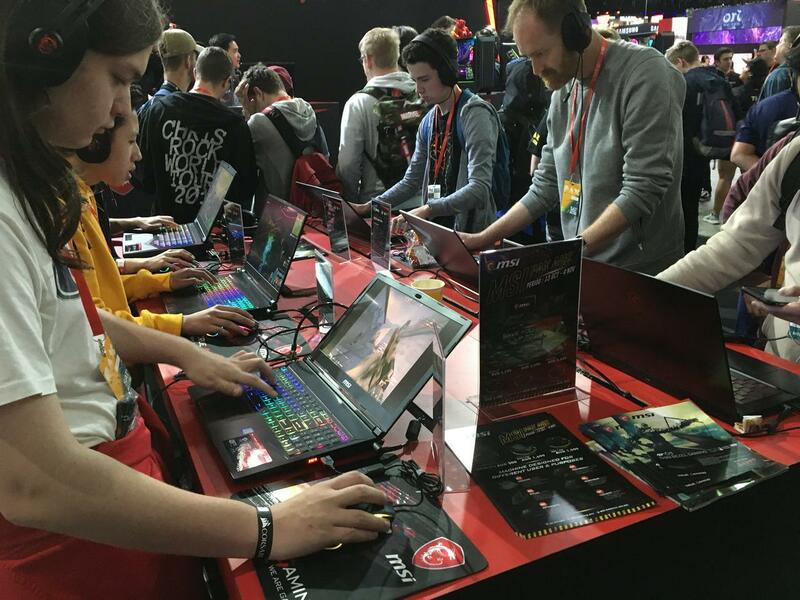 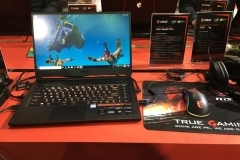 The Alienware gaming laptops were even smaller again this year – the ~20mm thin Alienware m15 captured our interest but there was something on show for everyone. 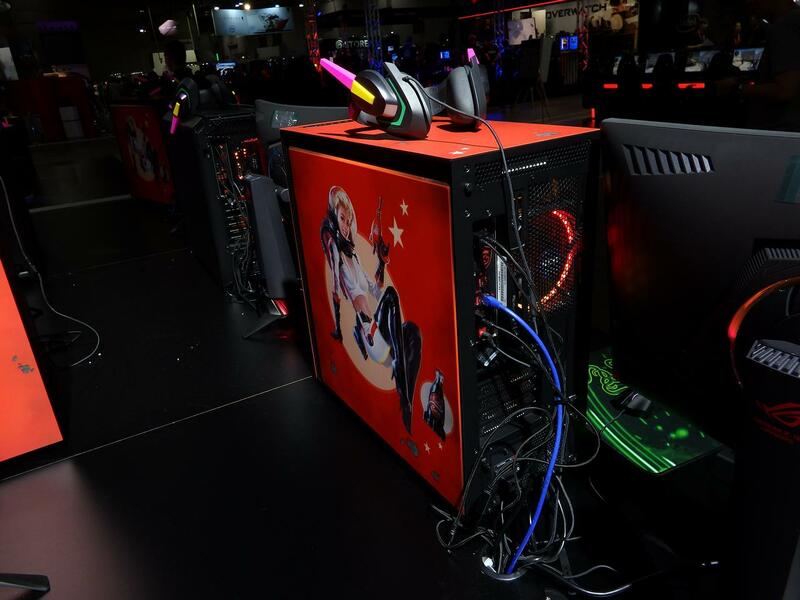 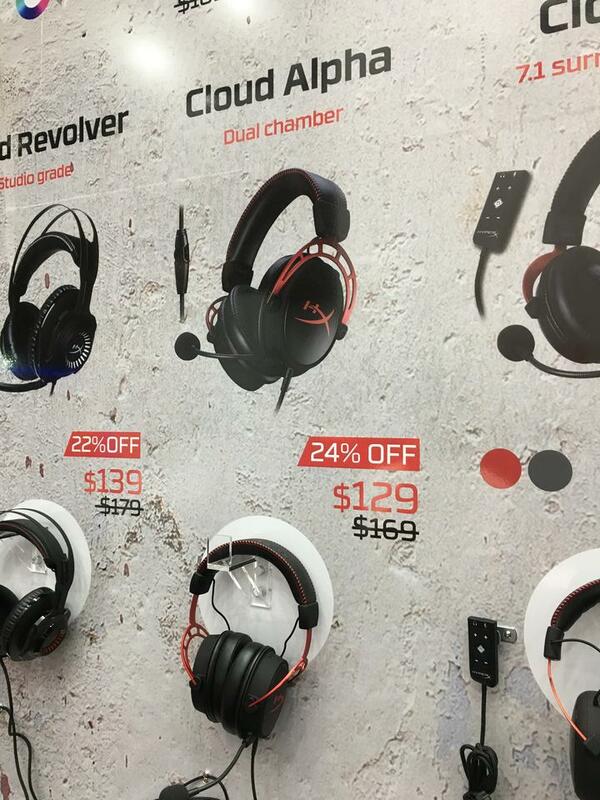 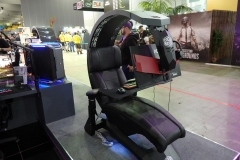 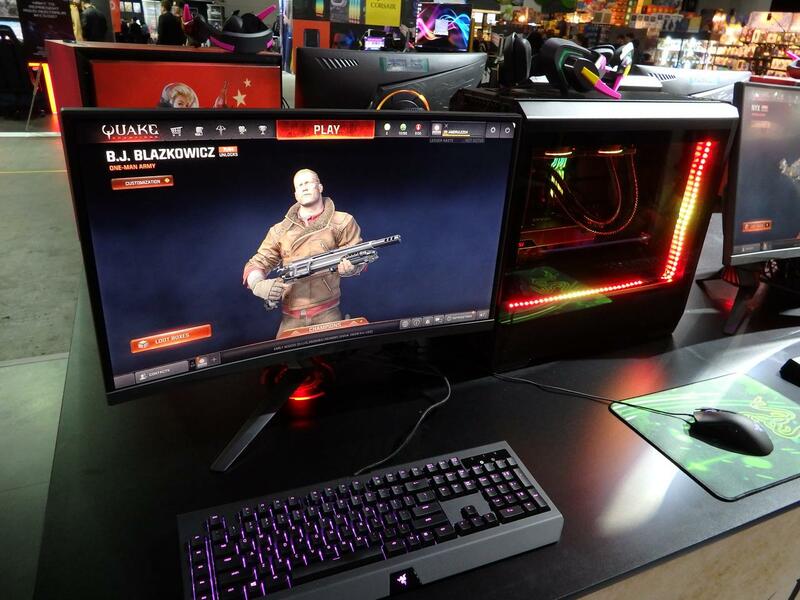 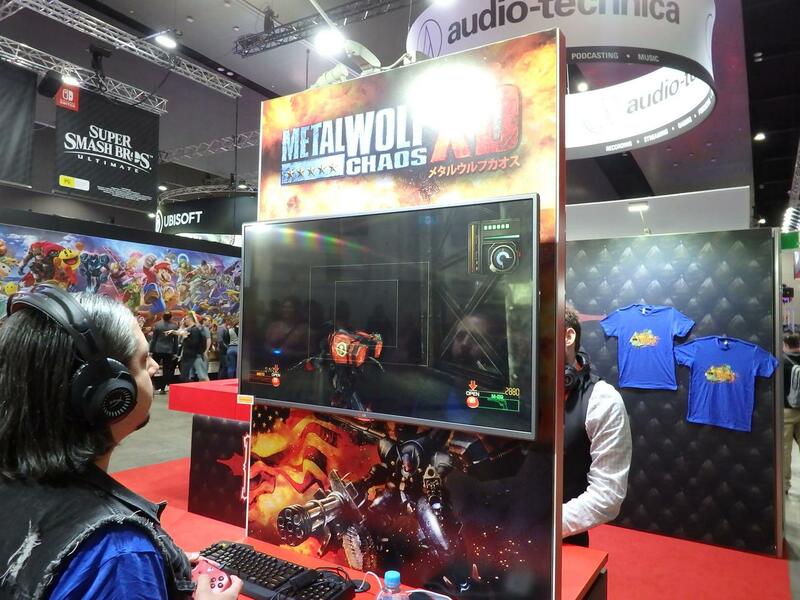 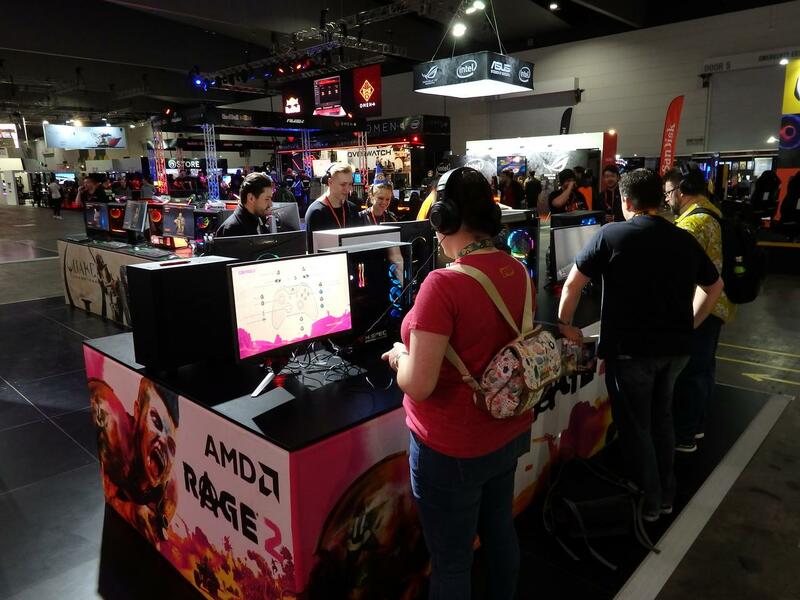 These machines are also usually available to see in person at JB HIFI so if you missed PAX and want to check out the range, you may only have to go as far as your local shopping complex. 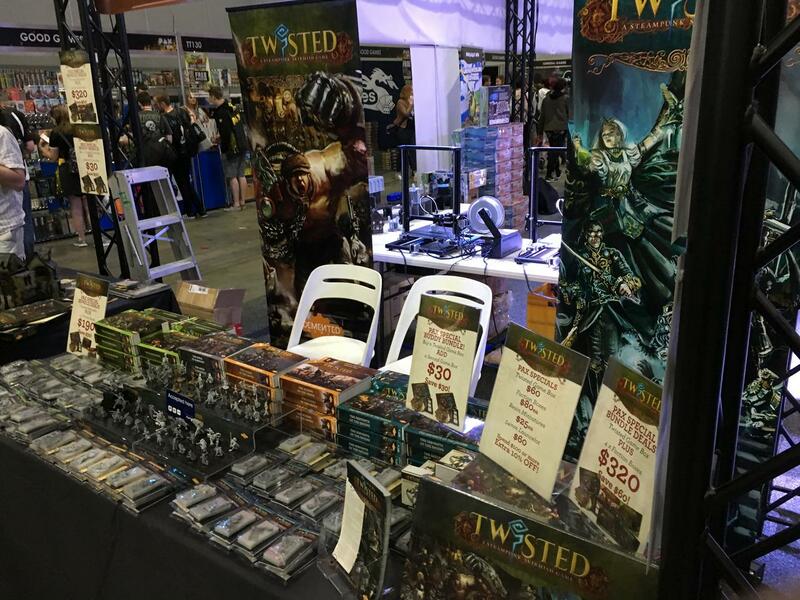 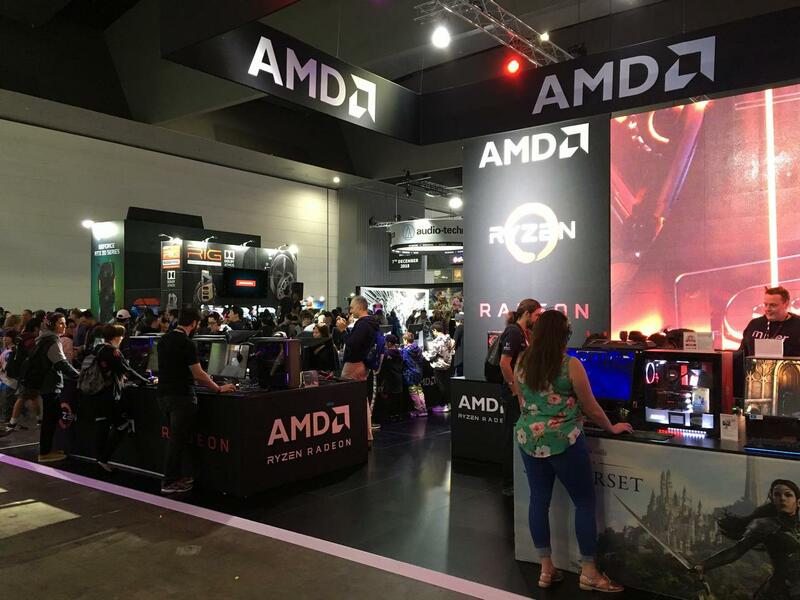 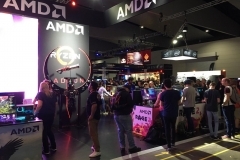 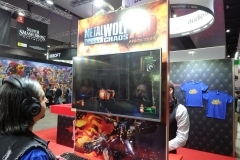 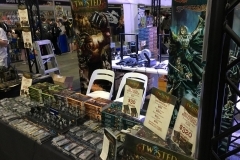 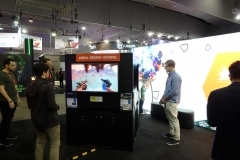 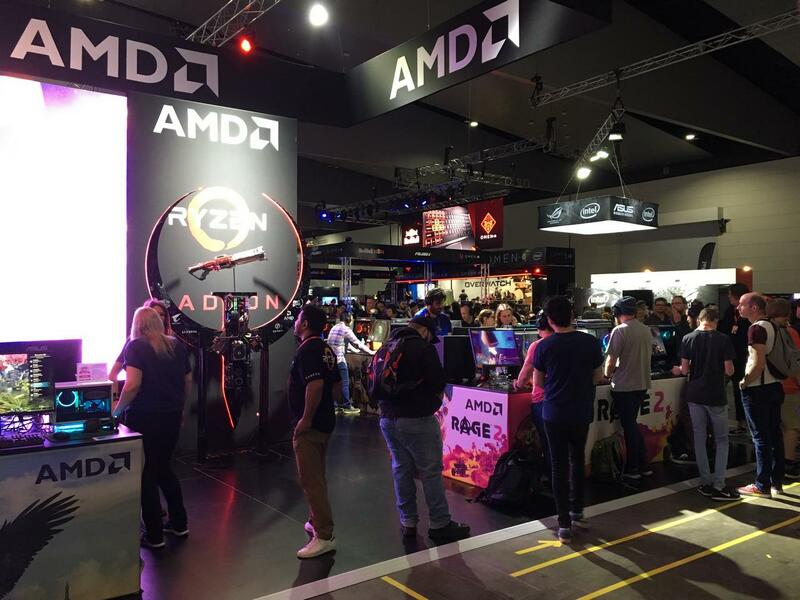 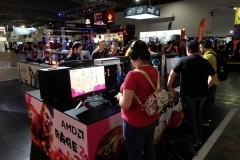 If there is such a thing as an “Event Booth Strut”, these guys were the John Travolta of PAX Melbourne this year with a high energy booth boasting Rage 2 among other AAA titles and a team of people proudly wearing RYZEN T-shirts. 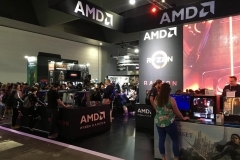 Why wouldn’t they be feeling proud – AMD’s comeback to the CPU and APU market with RYZEN has been remarkable and the performance/value prospect of their second generation RYZEN and THREADRIPPER CPUs this year disrupted the market. 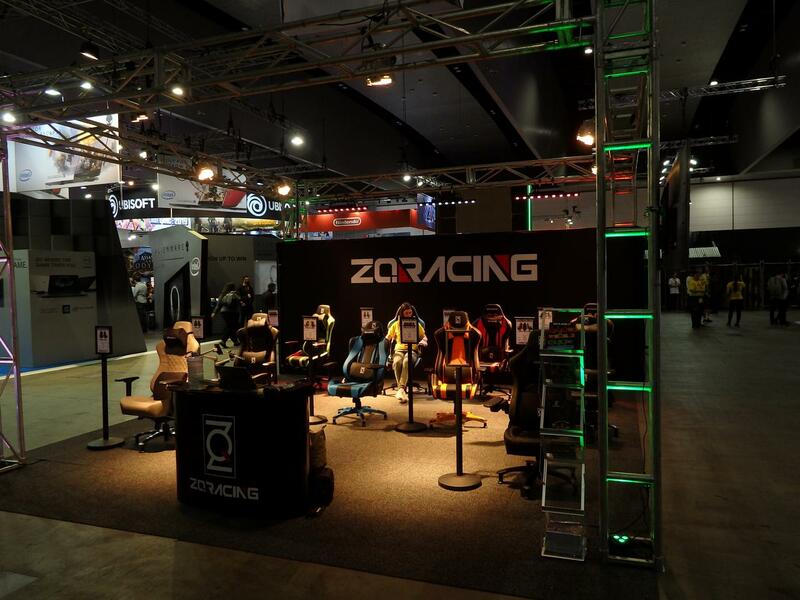 ZQRACING chairs were there in numbers. 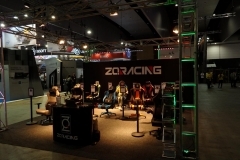 I checked out the Ultra series as it’s the direct competitor to the DXRacer chairs we have in the lab and found the ZQRACING alternative to be firmer and more comfortable. 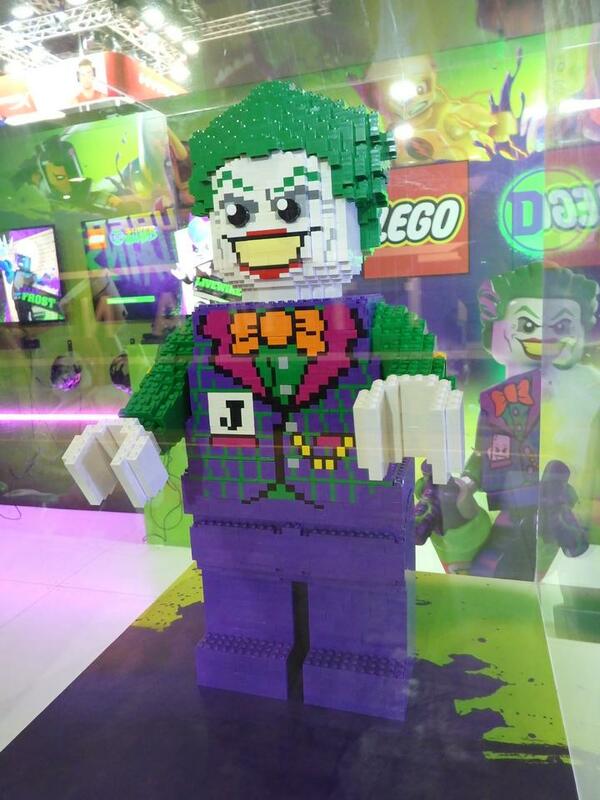 The construction seems solid and I couldn’t see any cheapness or cosmetic faults in the display stock. 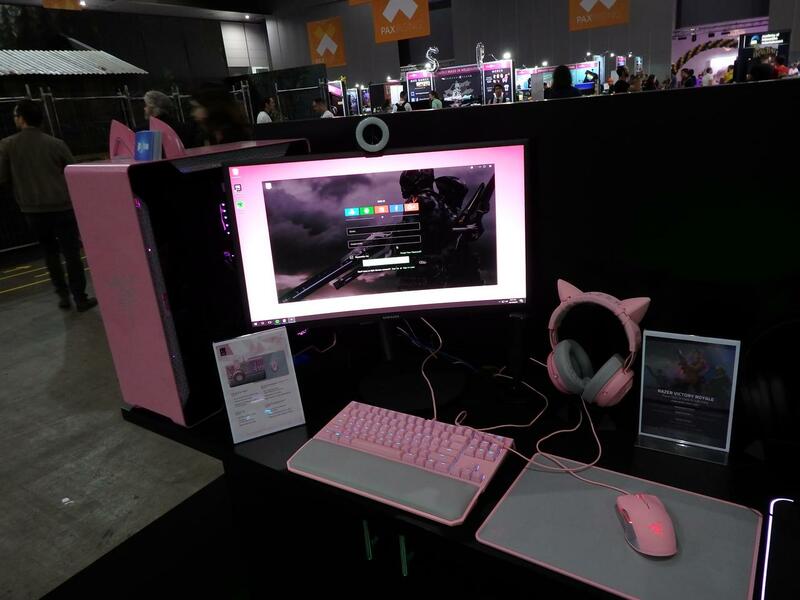 It’s always hard to tell at an event like PAX but the range looked and felt great. 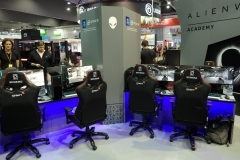 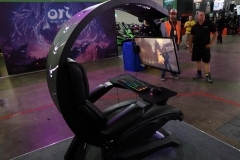 Check out ZQRACING.COM.AU for more info on their chairs. 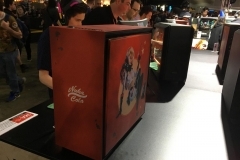 Random inspiring case mods, pop culture, cosplayers and other cool stuff was scattered around the event. 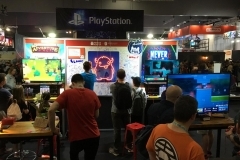 It all adds to the atmosphere and it’s great to see recognition go to the creators when people stop to appreciate the effort involved. 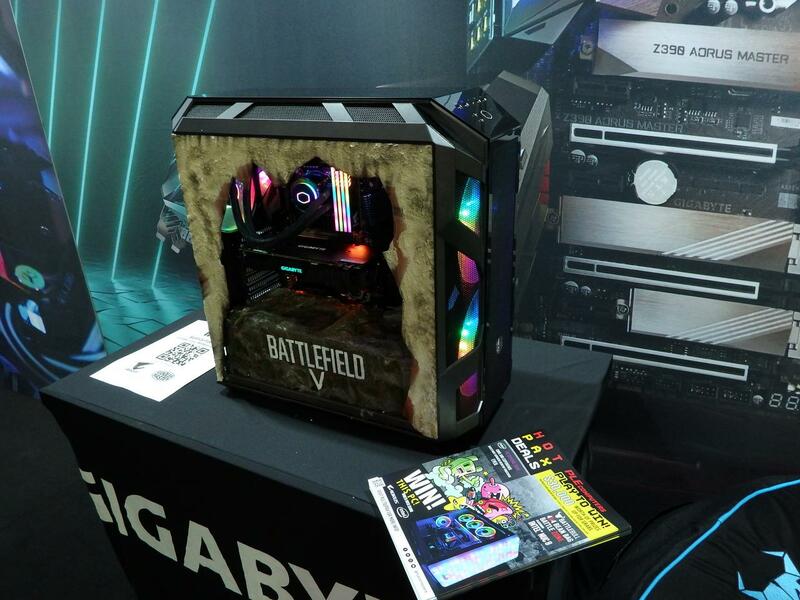 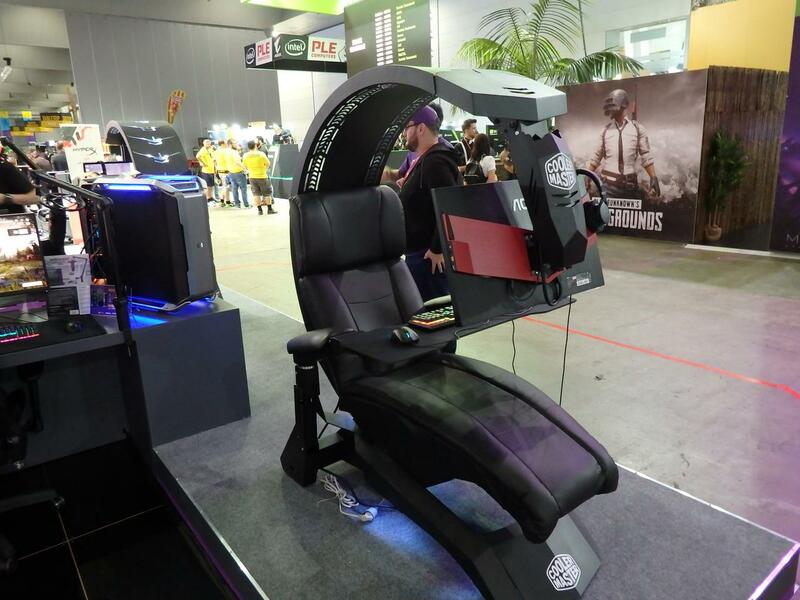 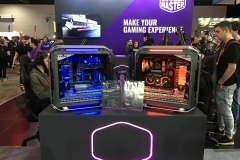 With peripherals being a focus in the PC Hardware vendor booths, Cooler Master brought their A-game. 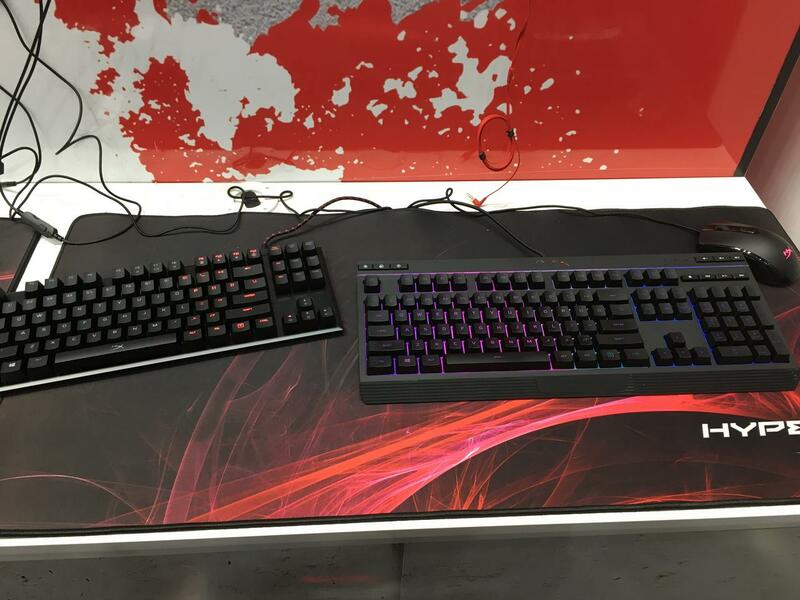 The keyboards, mice and mouse pads on display was extensive but they had a good crew on hand to point out the differences and help people see which might suit their needs best. 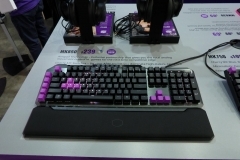 The stand out for me was the MK850 keyboard with analogue cluster around the WASD keys , magnetic wrist rest and Cherry MX switches – The concept of the Aimpad Technology where keys are not either actuated or idle but have analogue control like a game-pad could be a literal game changer for simulation gamers. 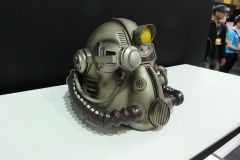 I didn’t get a clear release date for this but it’s listed as coming soon. 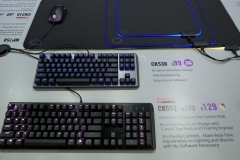 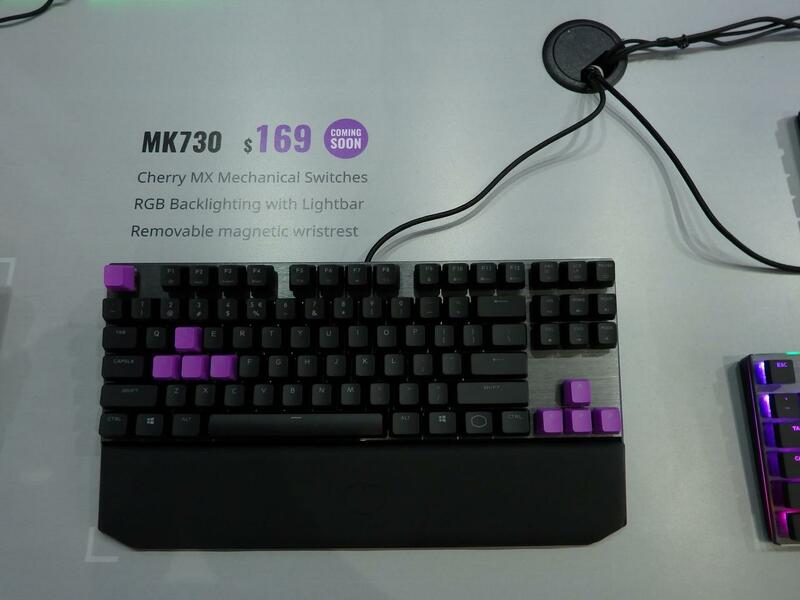 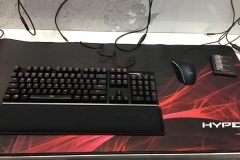 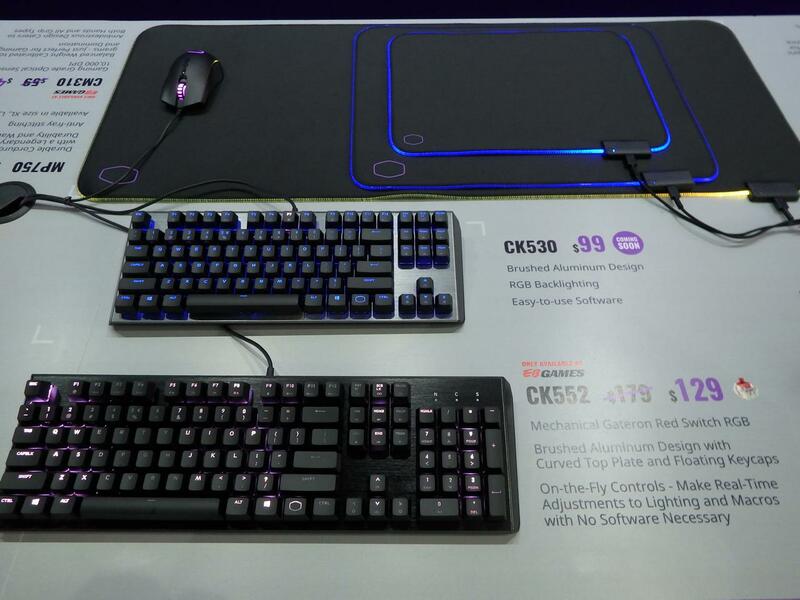 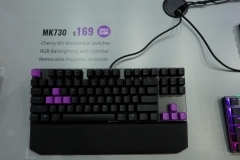 The ten-keyless MK730 keyboard and MM830 MMORPG mouse were also promising products – also listed as “coming soon” for Cooler Master. 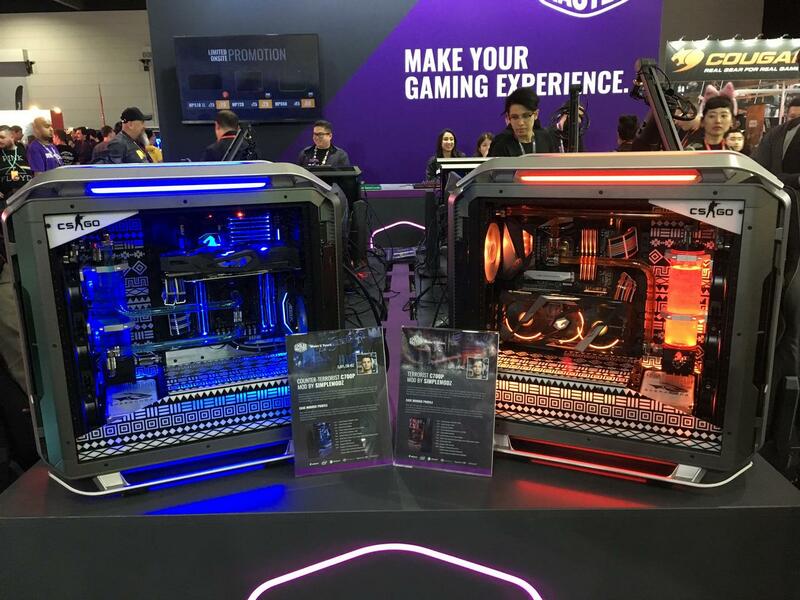 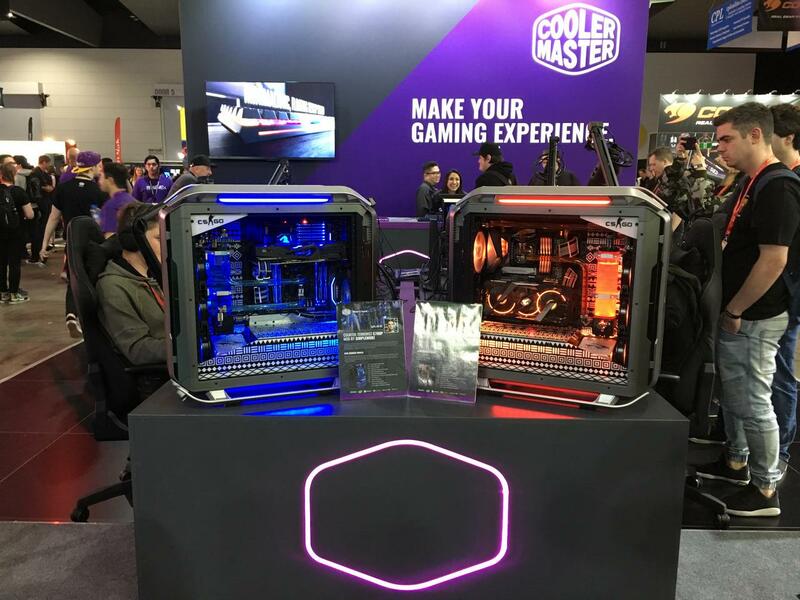 Finally, there were two very eye-catching Cooler Master Cosmos C700P modded systems by SIMPLEMODZ that looked epic at the front of the booth. 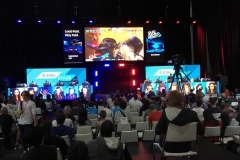 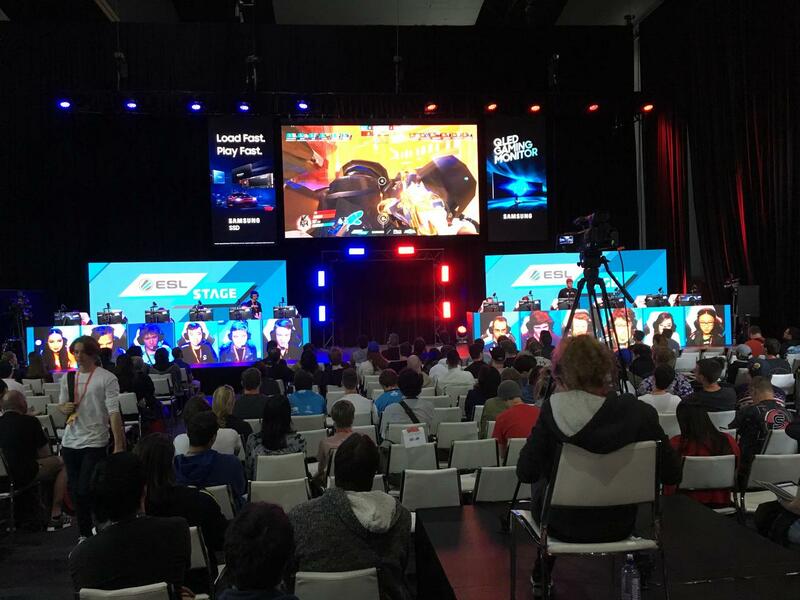 With many events running on the ESL stage, I managed to take in a few games from the spectator gallery. 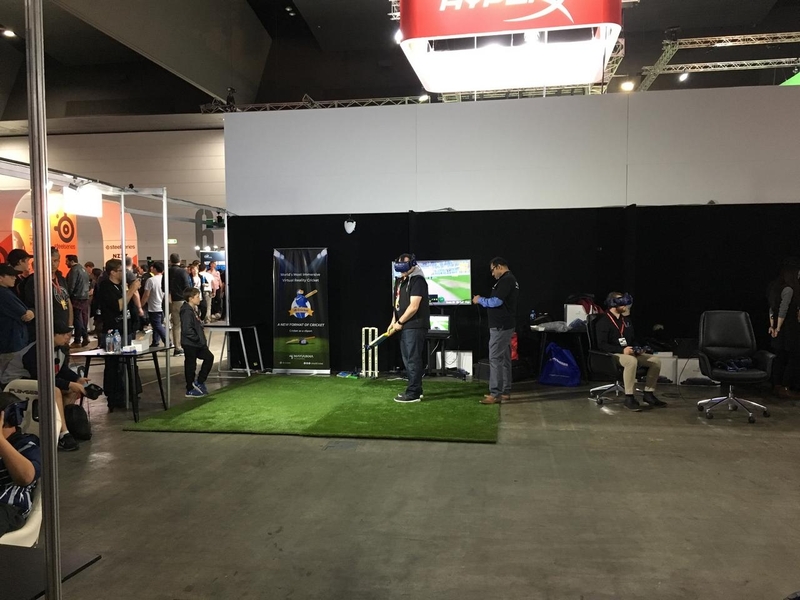 The skill on show was to be expected but the crowd enthusiasm seemed even more intense than last year. 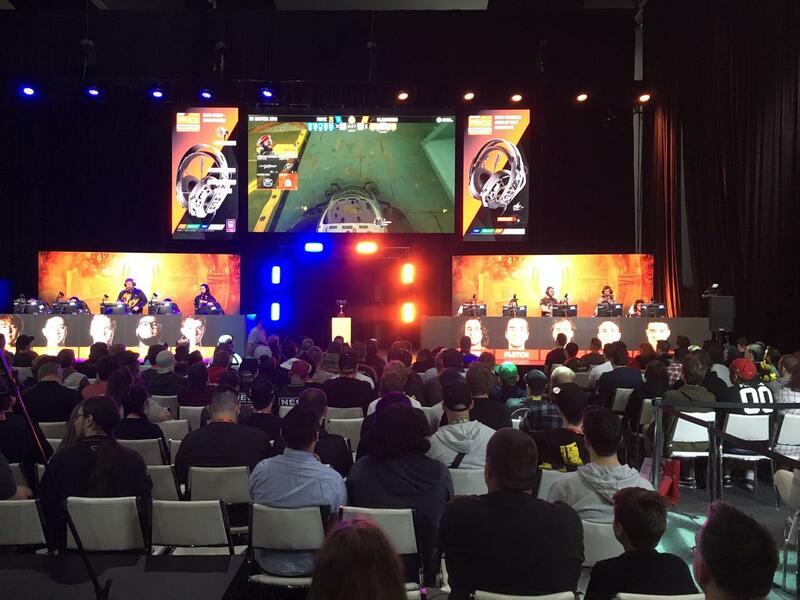 One game of Rainbow 6 Siege really came down to the wire and the cheers from the large crowd that had gathered were a positive sign for Esports. 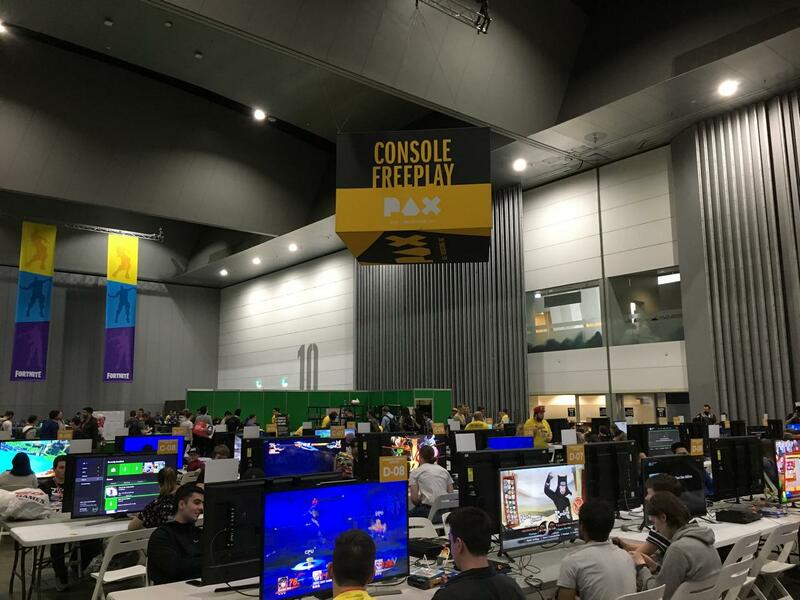 PAX is all about trying new things and the opportunity provided in the Freeplay and tournament hall gave access to the masses. 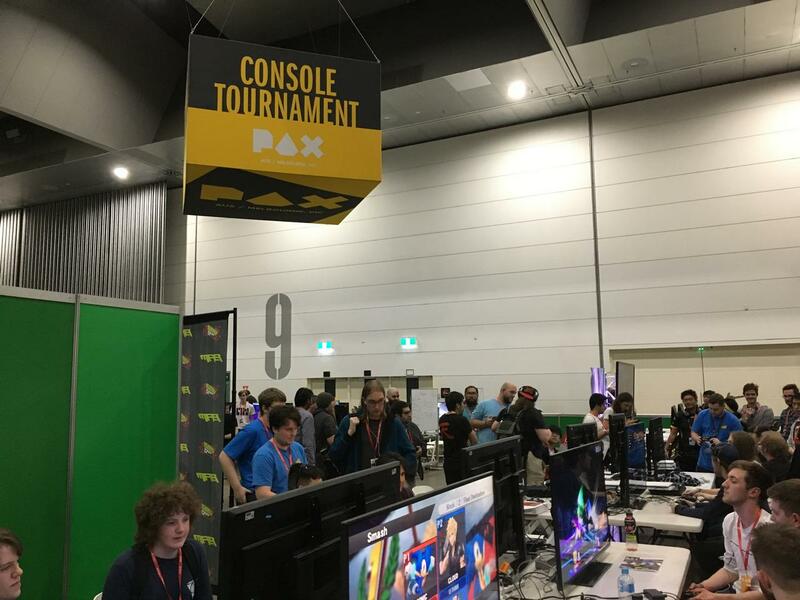 Despite the queues, attendees seemed to be having a great time checking out VR titles like Super Hot on the Oculus Rift and Fortnite on the fleet of Intel Gaming NUCs. 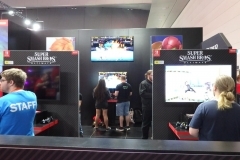 Consoles were also available with free seats a rarity. 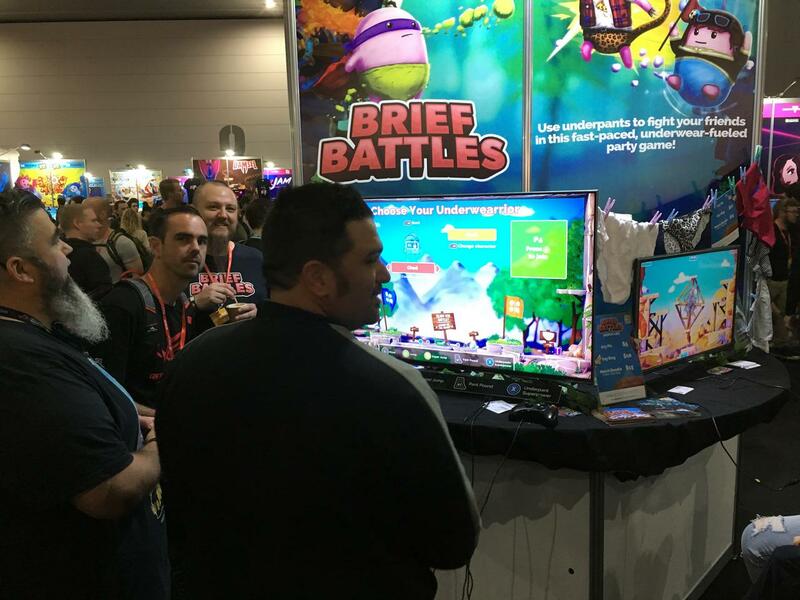 There were some impressive titles on display and my favourite was Brief Battles that returned after last year. 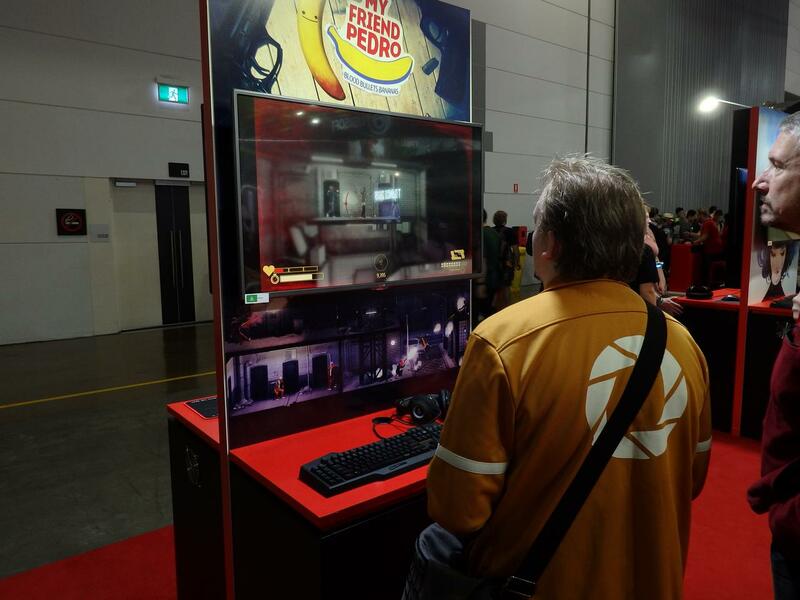 Check it out on Steam and add it to your watch list if you like the look of it. 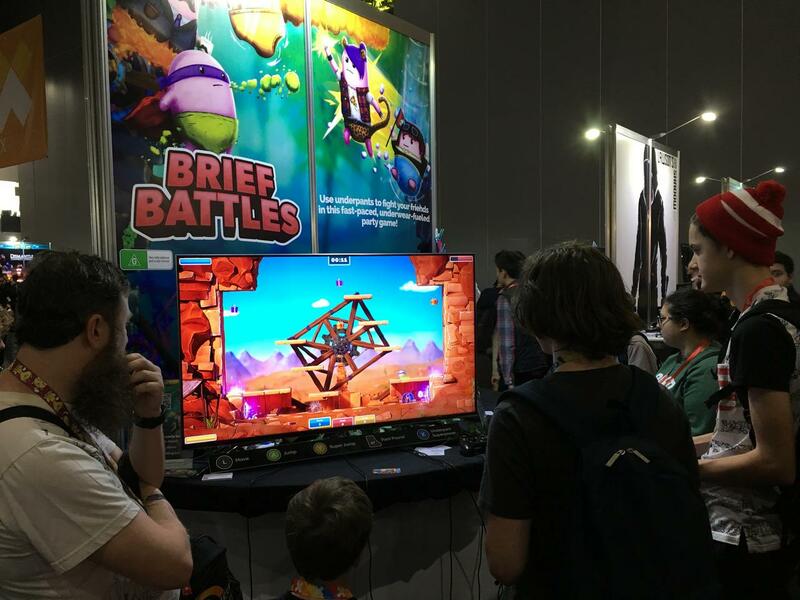 I had a crack at this with Sean and Luke from KWASTEK and got absolutely smashed in a best of five short rounds. 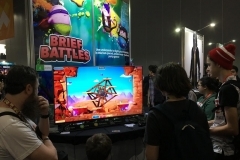 The game is a creative platformer with a great colour palette and an easy to use game mechanic. 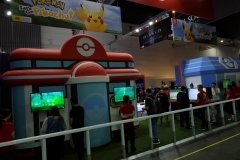 The use of hazards and portals mean that you have to worry about more than just the other players. 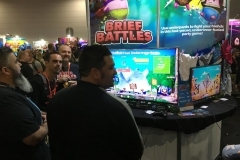 This game is a lot of fun and I’m looking forward to it being available for purchase. 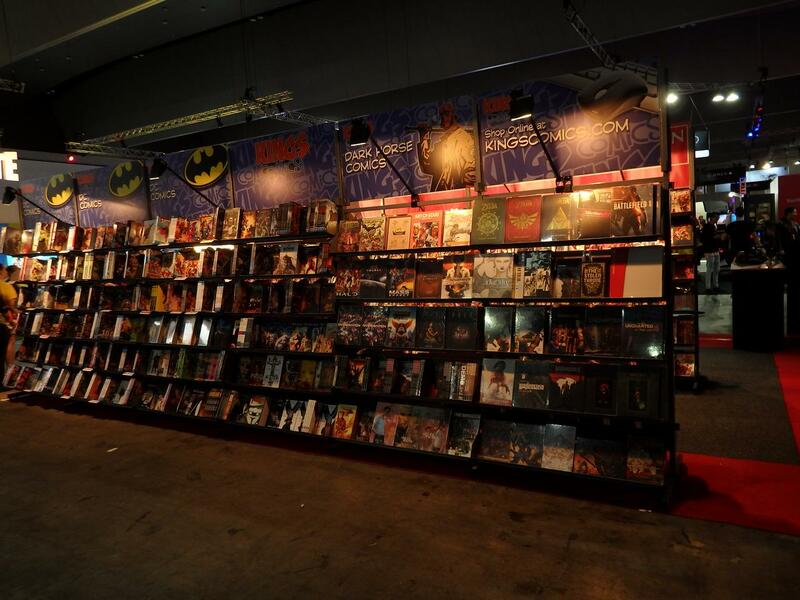 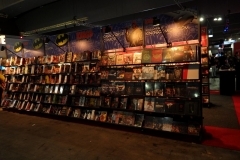 There were many other titles on show in various stages from development to market ready. 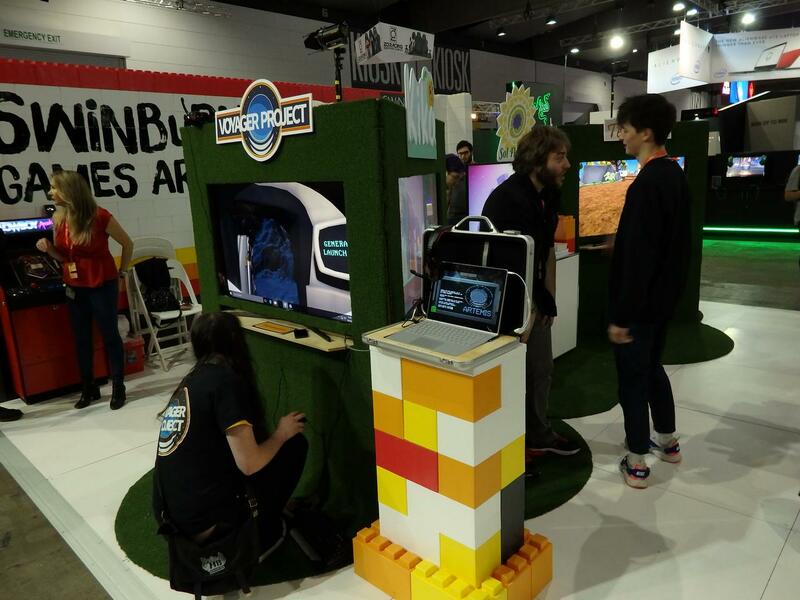 Thumbs up to the Indie software developers for their creativity and enthusiasm. 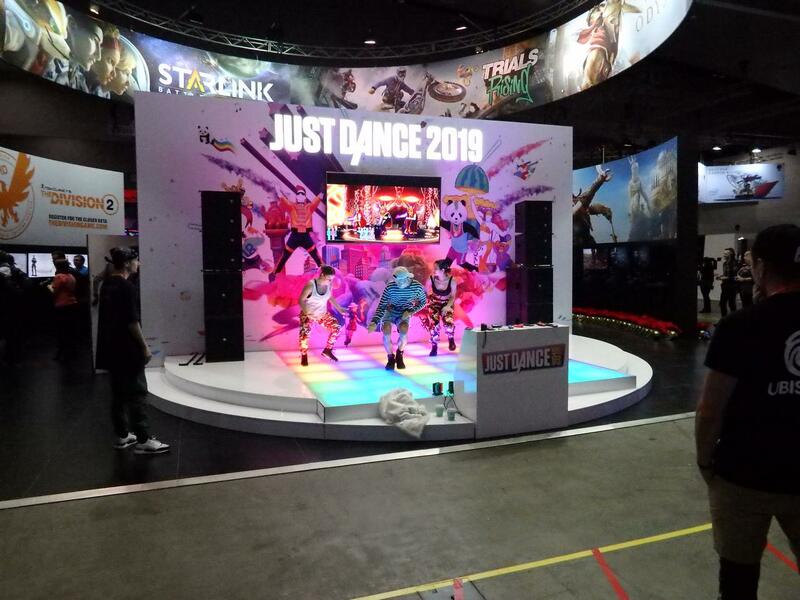 PAX wouldn’t be PAX without Just Dance on display and while there were other dance comps going, this was the stand out again. 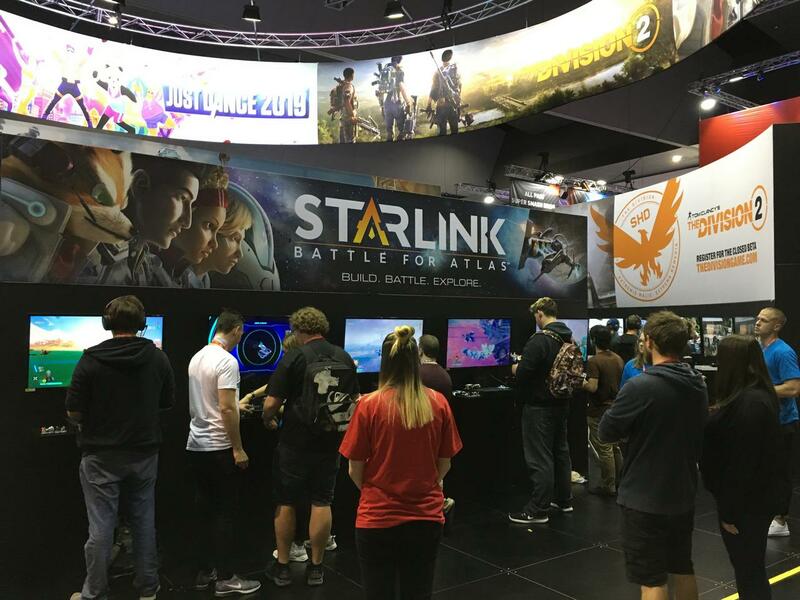 For those wanting to know where to begin their video game creation career, there were several institutions represented at PAX2018 with knowledgeable delegates to explain the courses available. 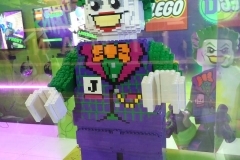 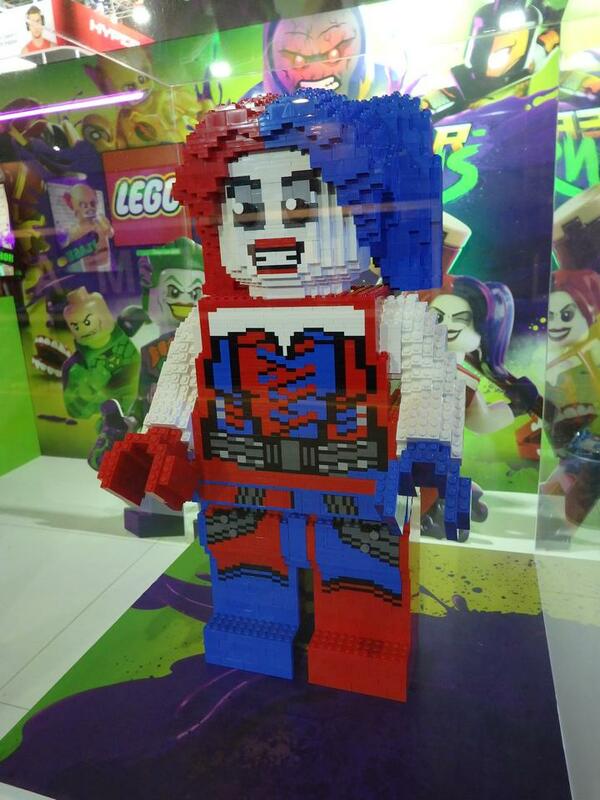 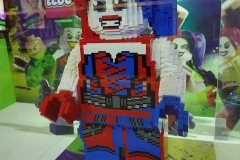 Who doesn’t like Lego? 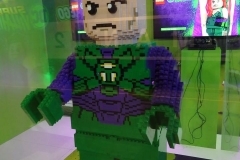 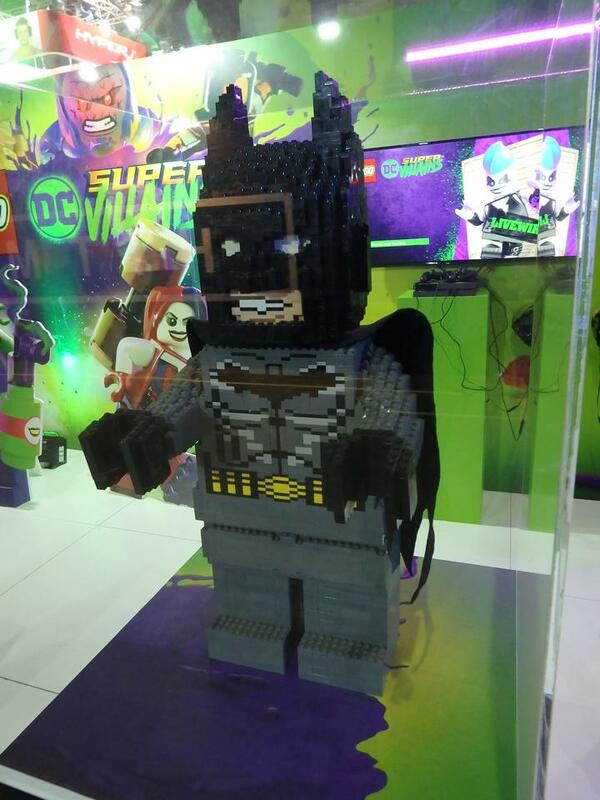 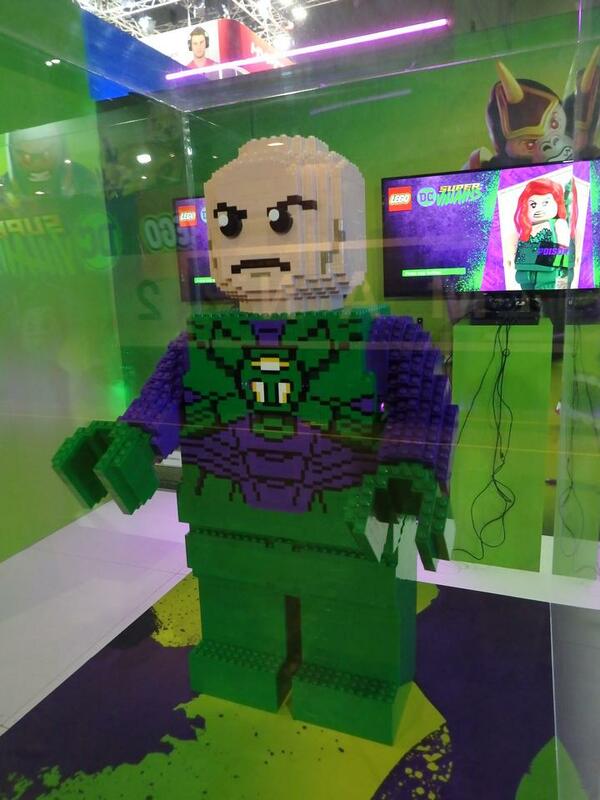 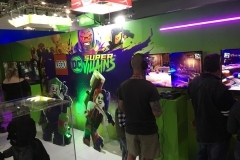 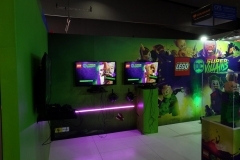 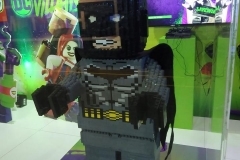 The display was simple but effective with the DC Lego figures in place to keep people interested while queuing for some hands on time with DC Super Villains. 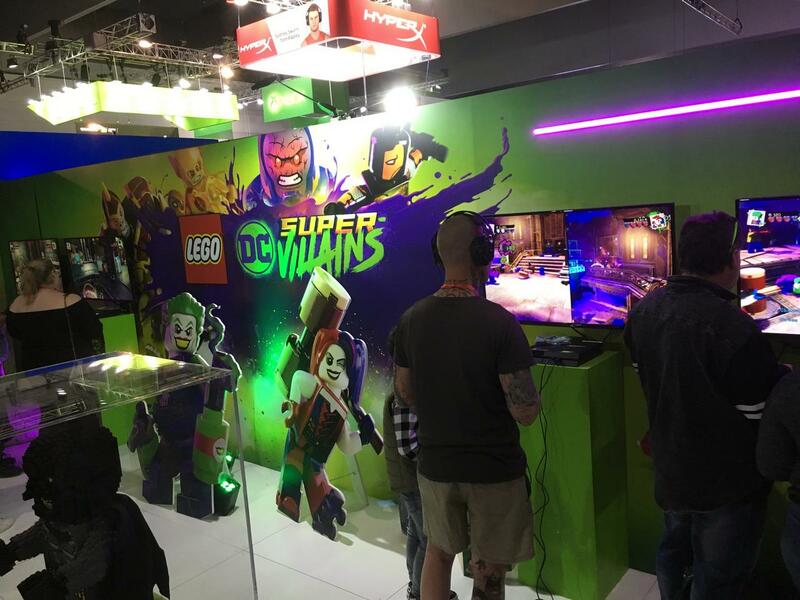 The Lego games are great and I’ve enjoyed them on my loungeroom TV via a Steam Link since the Star Wars Trilogy came out. 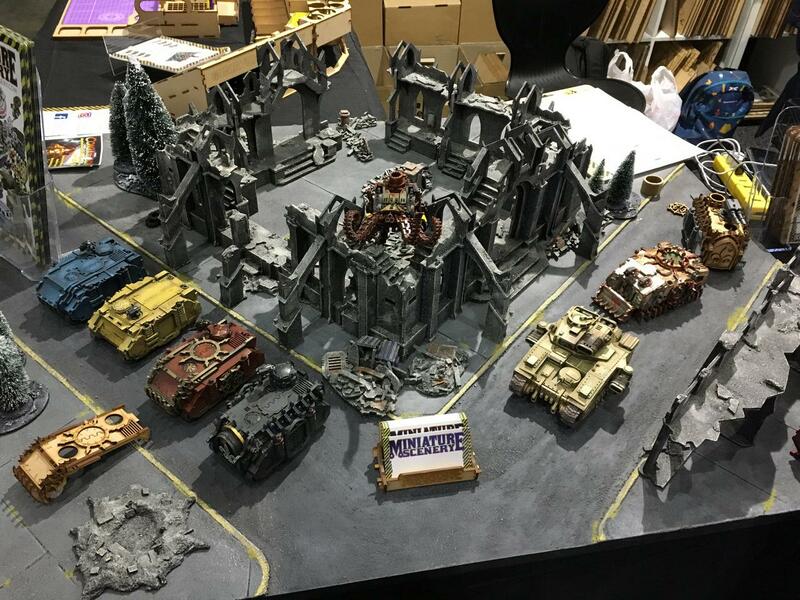 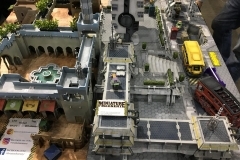 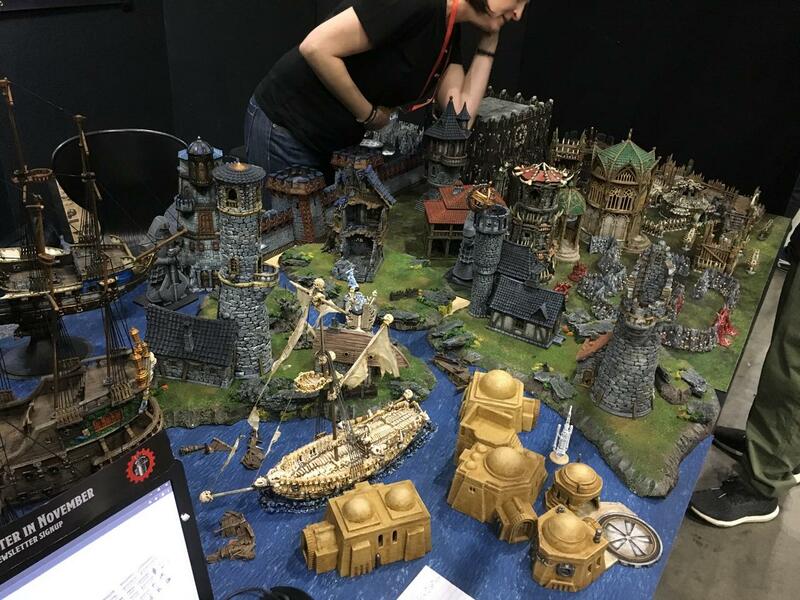 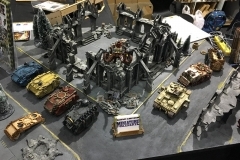 Personally, I like the idea of miniatures, I’m blown away by the level of detail in the models and the talent of those that can create the scenery/figurine sets that I see at PAX every year. 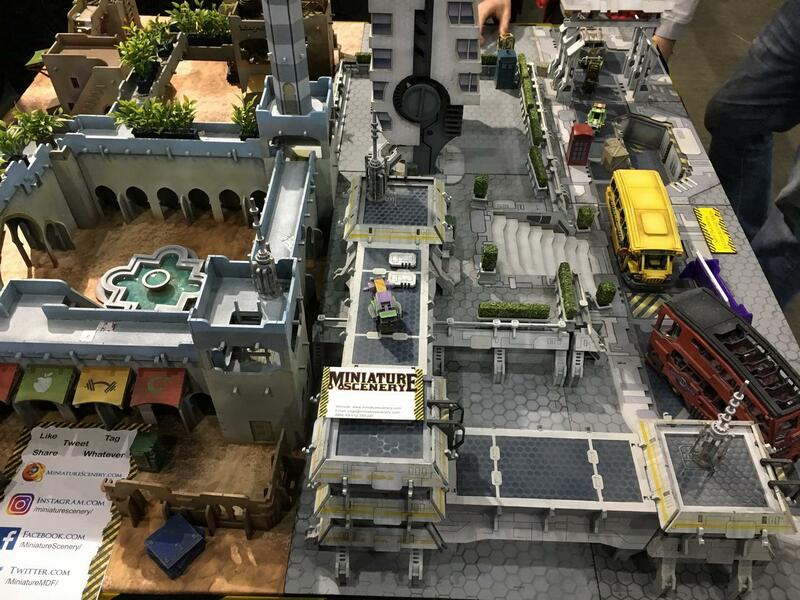 The sets are absolutely amazing. 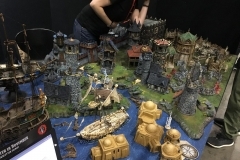 Although I don’t have the time to actually embrace the tabletop/miniatures world, I can appreciate the art on display. 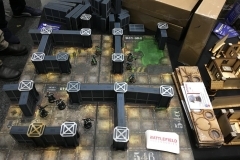 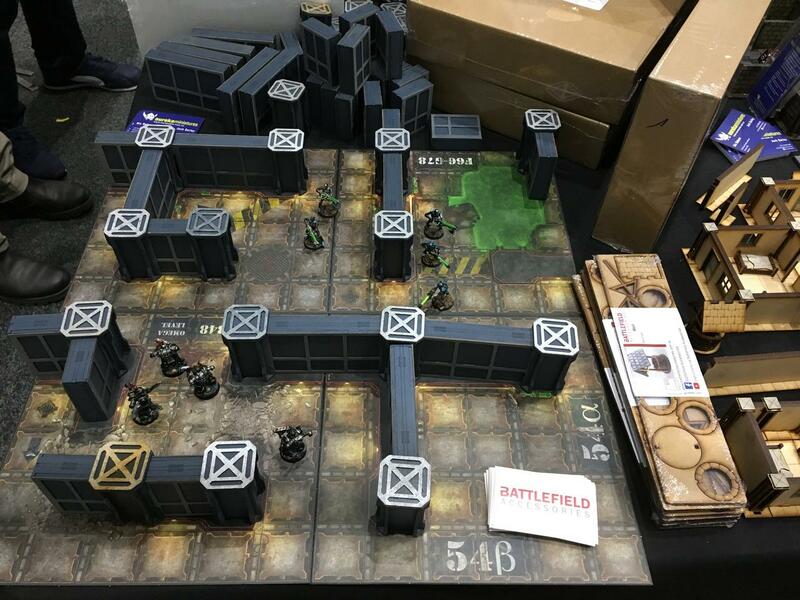 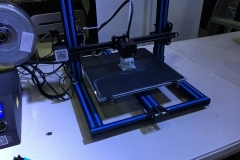 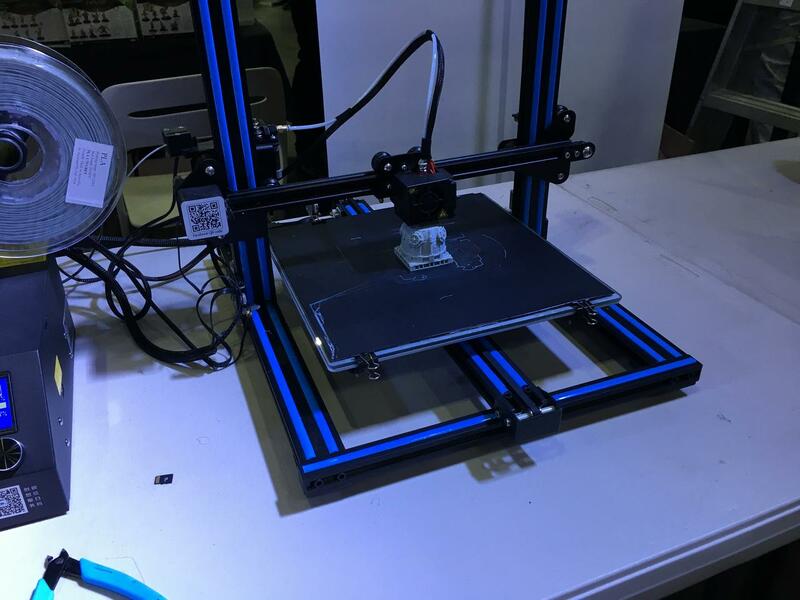 This year 3D printing technology was on display with both painted models and unpainted models being shown at some stands – there was even a live 3D printing demonstration running. 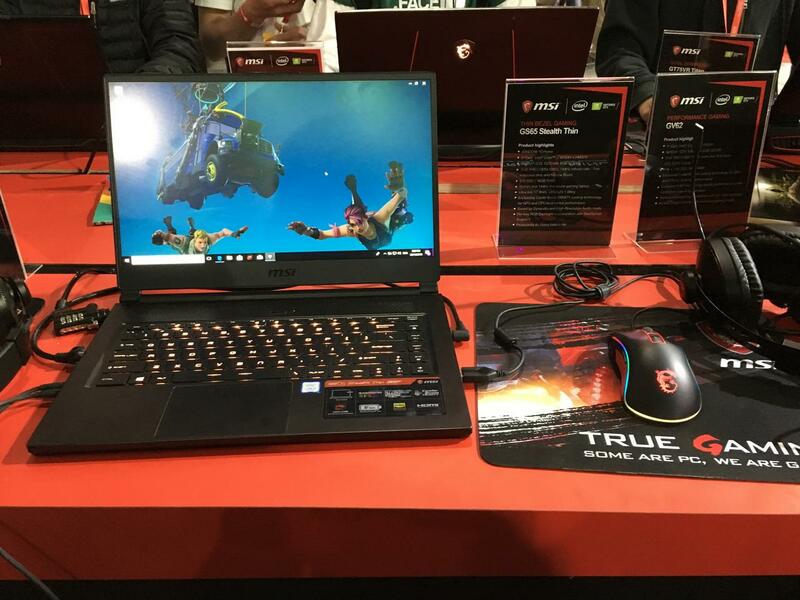 GS65 Stealth Thin gaming laptop with i7-8750H, GTX 1070, 144Hz 1080p 15.6″ screen and 512GB SSD. 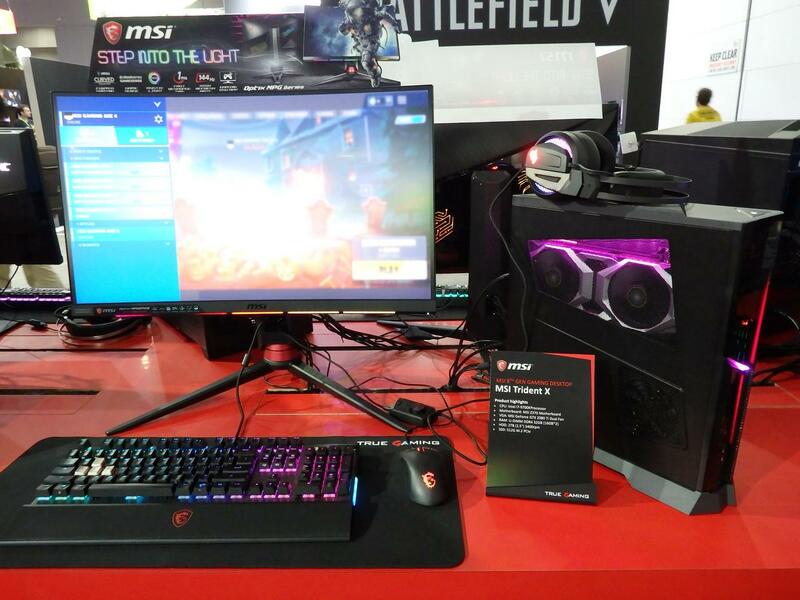 Trident X desktop in a small form factor that packs some serious power with RTX graphics and a high-end Intel CPU. 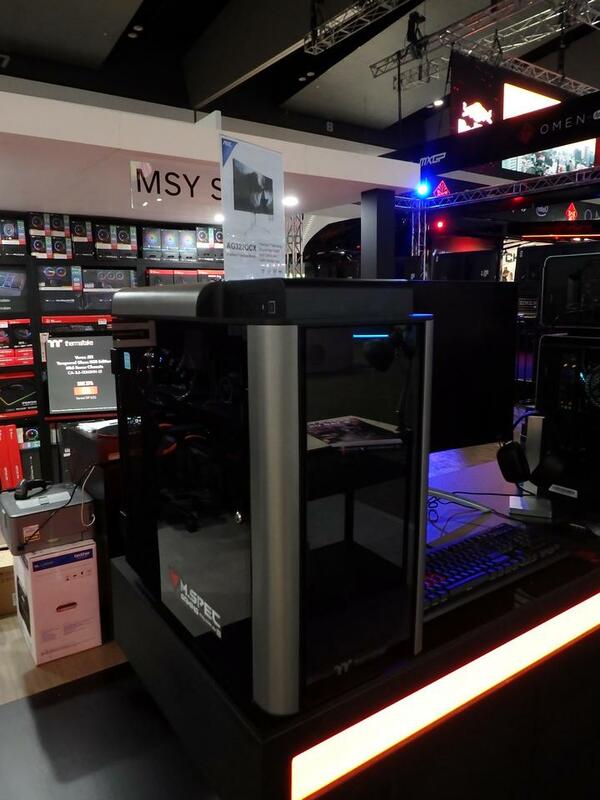 It really was a nice line up from MSI and they had a lot on display again this year. 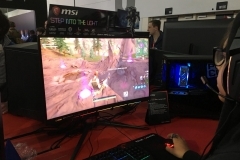 Fortnite was the game of choice here and the constant crowd seemed to appreciate it. 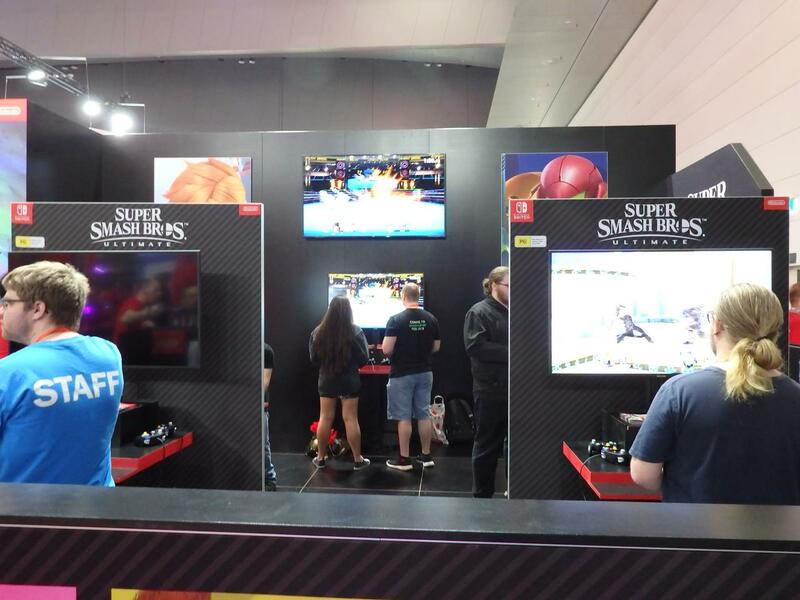 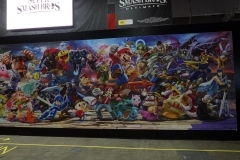 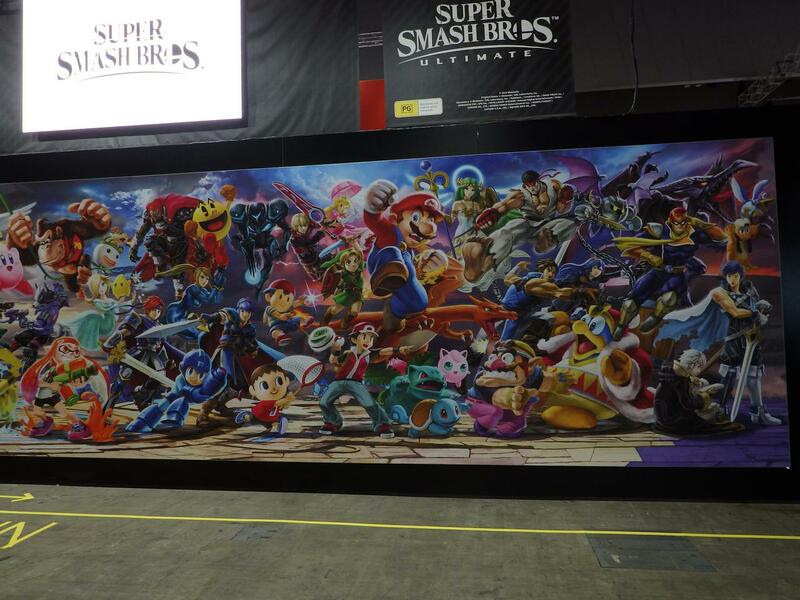 Super Smash Brothers featured at the Nintendo area and it was a prime opportunity to see and use a Switch in person for those who haven’t had the pleasure. 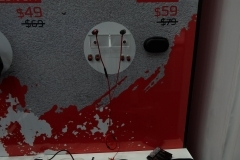 As a member of the PC Master Race, I enjoyed my time with the Switch so much that I can actually see myself buying one for my family as my first console purchase in more than 10 years. 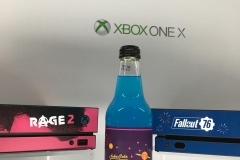 The Switch might not have the best graphics but you can’t deny how much fun this device can provide. 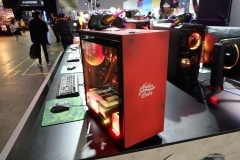 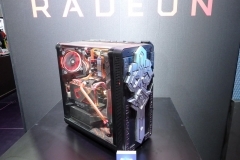 I saw this case and as a Fallout fan going back to the original games, the NZXT H700 case design immediately had me looking it up to find price and availability. 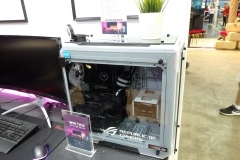 Sadly, this is where my interest ended as the price tag is $499 AUD which seems excessive when a standard H700 costs $229 – less than half the price. 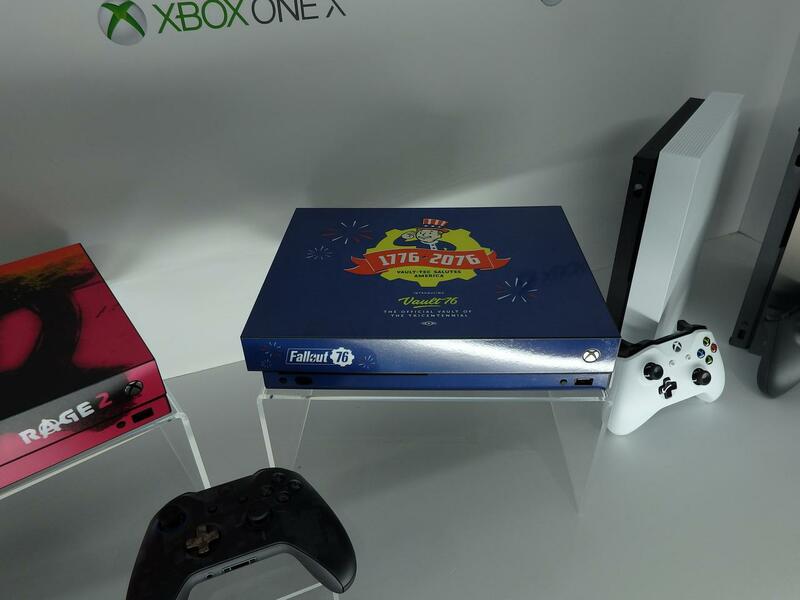 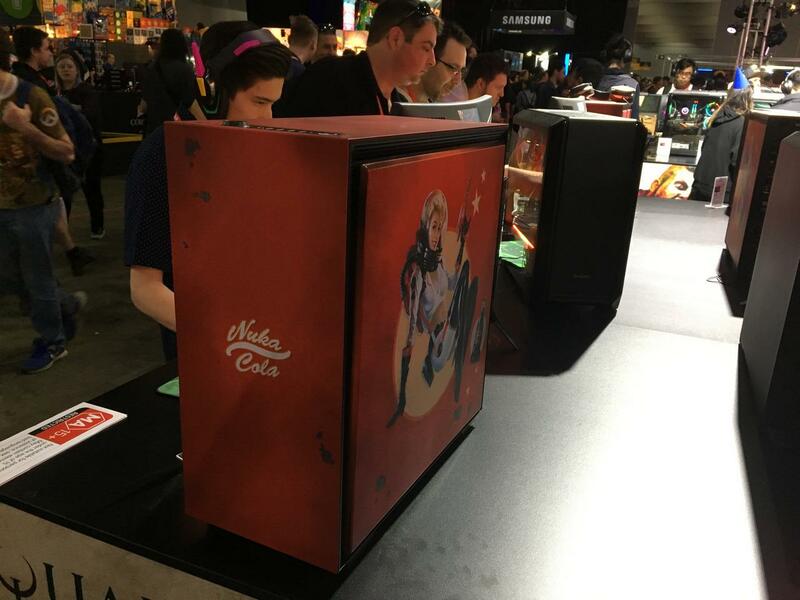 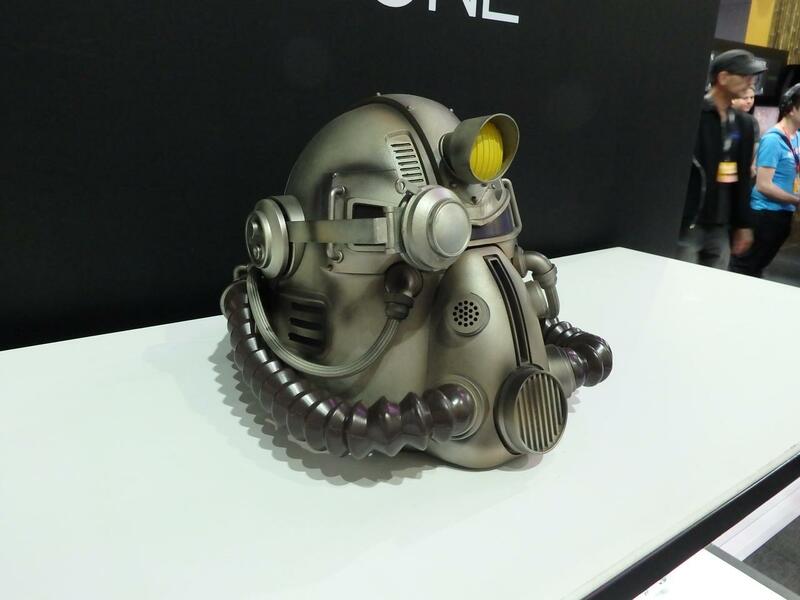 There is no denying that the design and print job of the limited edition “Nuka” version is a Fallout fan’s dream and they will sell – even at that price. 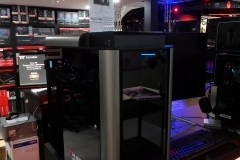 Personally, I’d consider the $389 Cooler Master C700P a better case and more reasonably priced. 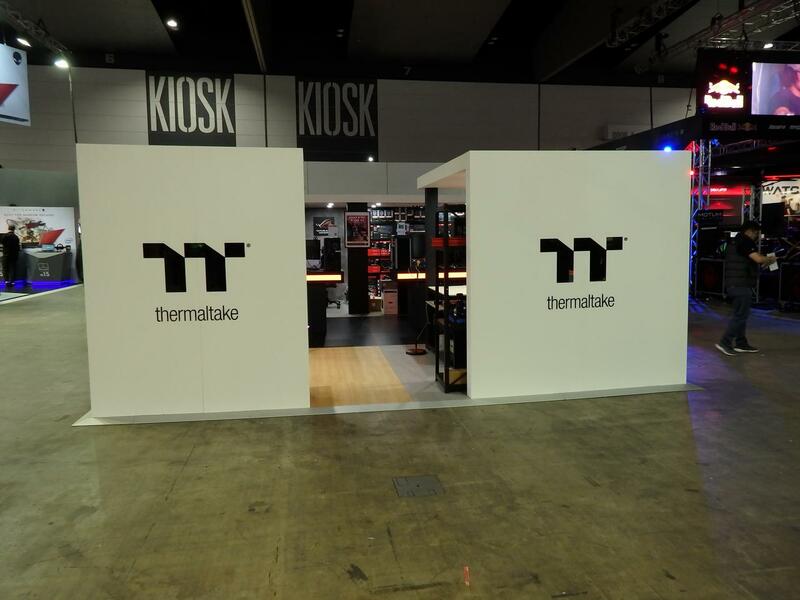 I went to Thermaltake’s booth to check out the Level 20 but the white (snow) View 71 on display looked to be the more attractive case. 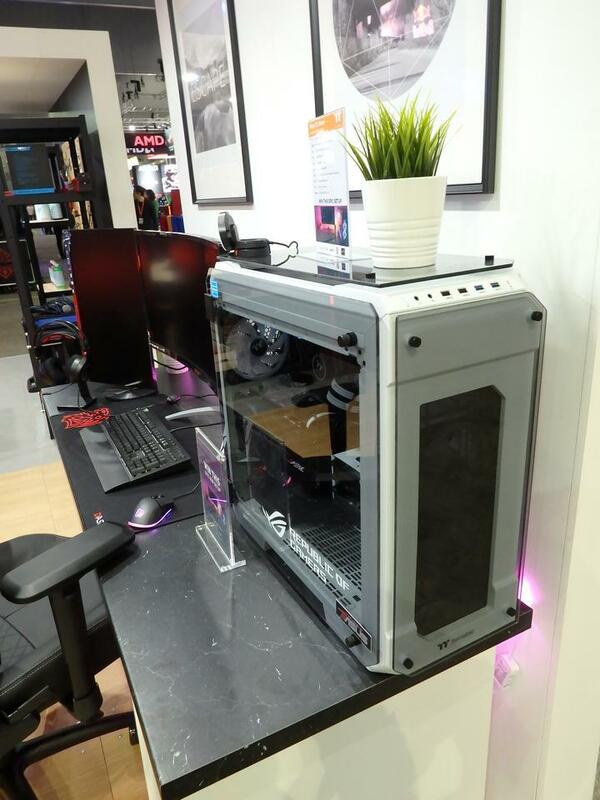 The Level 20 is a signature case for TT and there was also an impressive modded Level 20 at the Razer booth but the View 71 with tempered glass front and side panels looked so clean and slick, I found myself thinking about the best spot for it in my office. 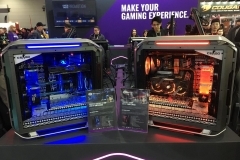 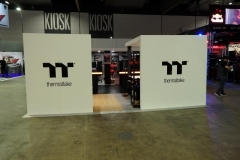 Thermaltake have a great range of cases from the budget Core V1 through to the Level 20 series with plenty in the middle so check out their range for your next build and don’t forget to spend a moment looking at their coolers too. 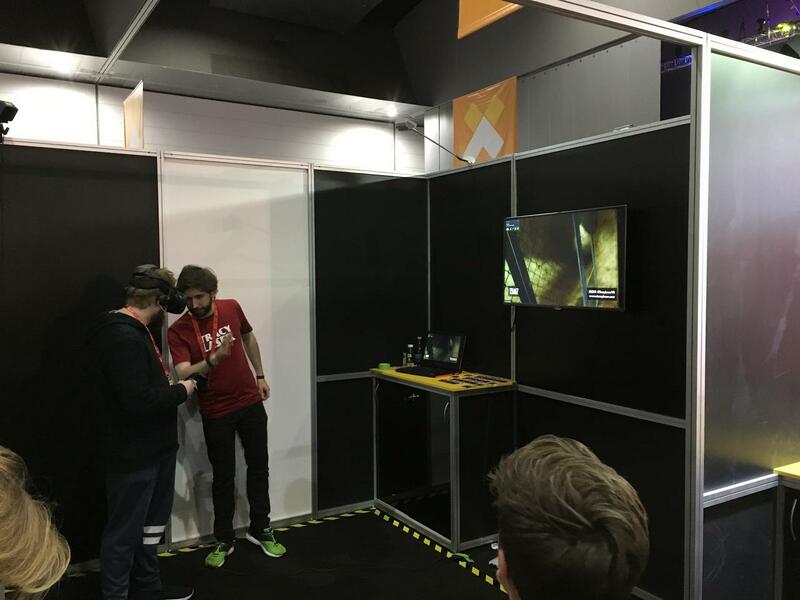 The bat seemed to hold the controllers securely in what is a compelling VR experience. 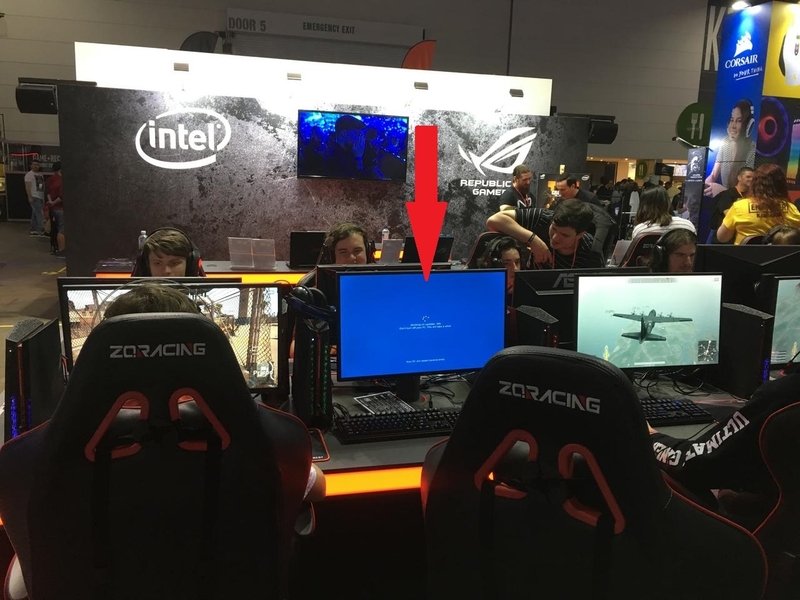 It wouldn’t be a PC event without a Microsoft Windows update hitting one of the booths and we caught this one on the Friday. 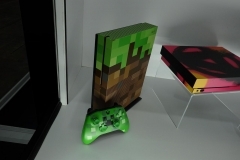 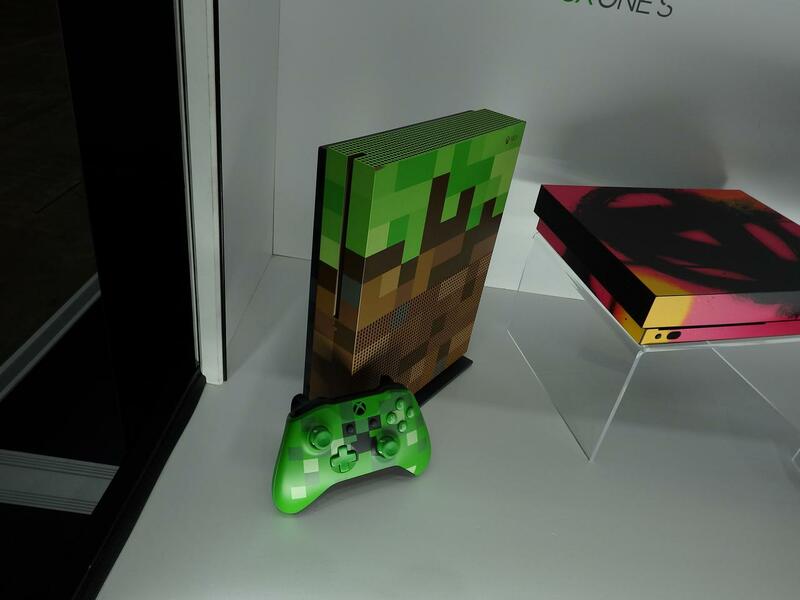 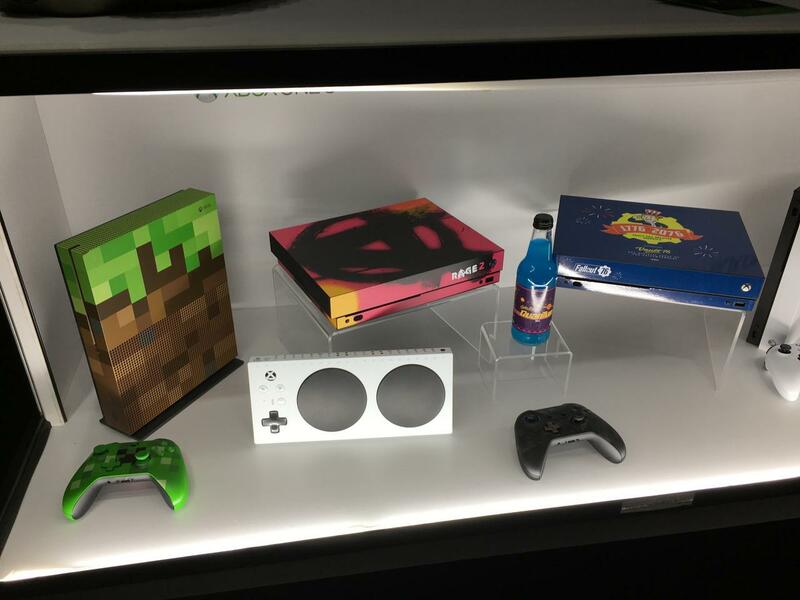 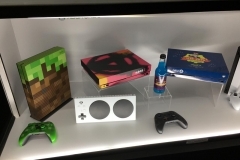 I’ll admit that I’m not a massive XBOX or PS4 fan, consoles just aren’t my thing but at PAX I love checking out the XBOX booth because they know how to put on a trade event and go all out. 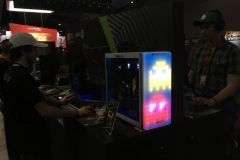 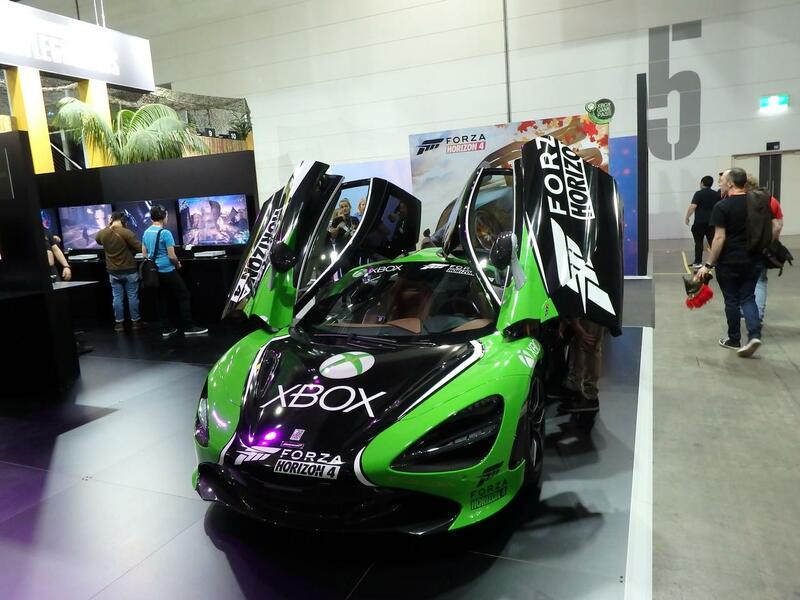 Racing cars, life sized Fallout memorabilia, Battlefield V and some of the neatest cosmetic skinned consoles I’ve ever seen had me drawn to the booth like a moth to a mozzie zapper. 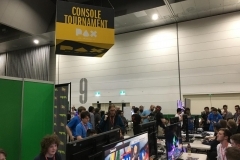 While I was there, I had to check out the latest titles and experience once again how bad I am with a controller – but yes I had fun and it’s PAX so there’s no judgement if you’re enjoying yourself and having a go. 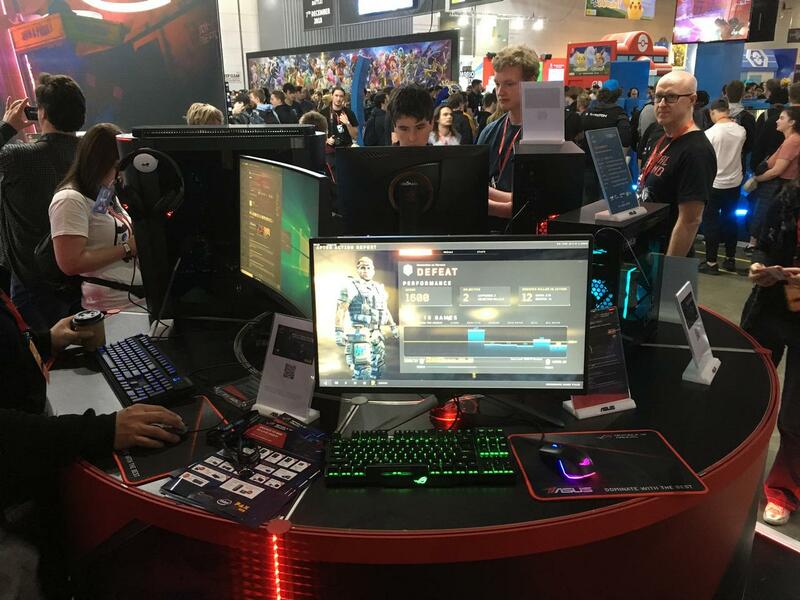 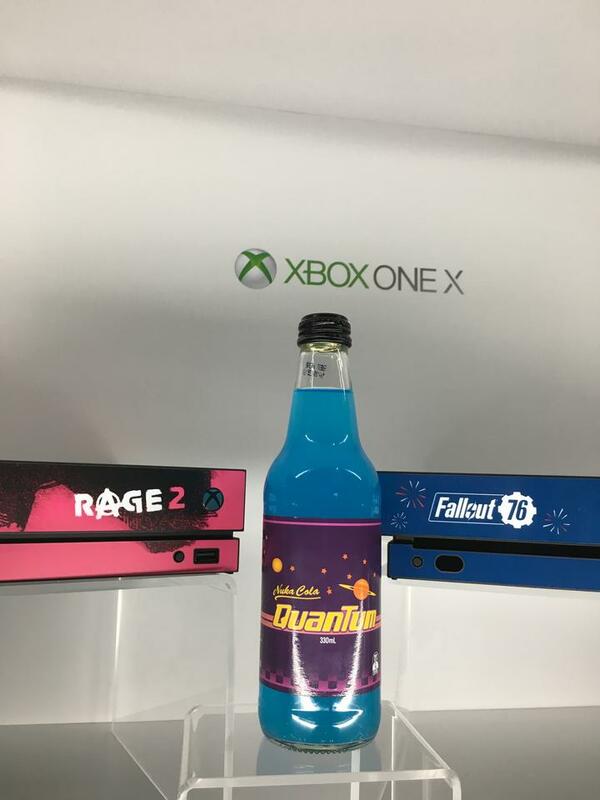 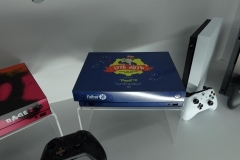 For people about to invest in a console but unsure about which one, PAX is the best way to see a range of games and ask people in the know – the range of titles available is going to be better than your local retailer. 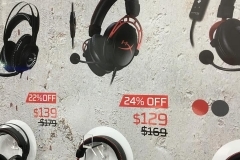 Was there anything missing? 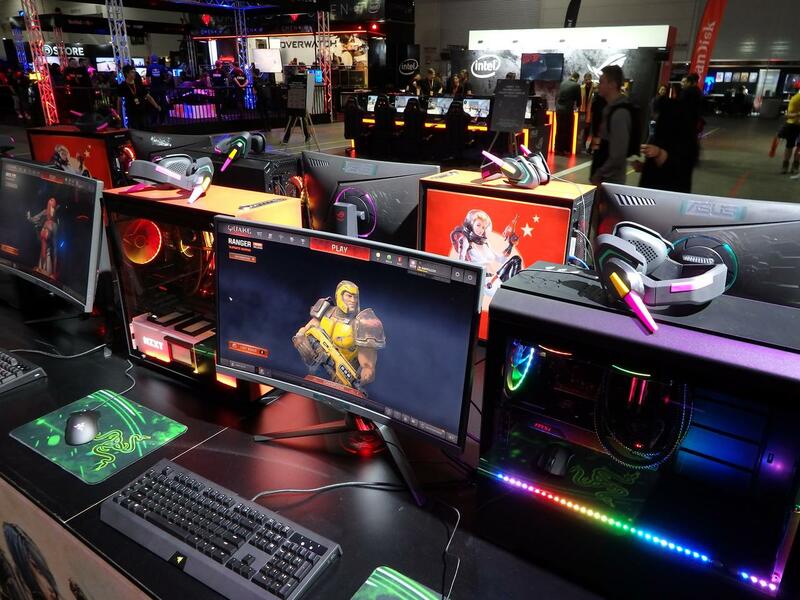 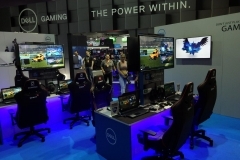 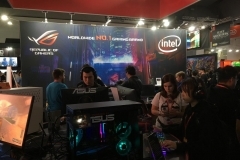 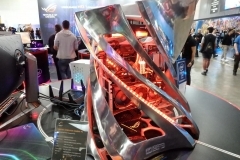 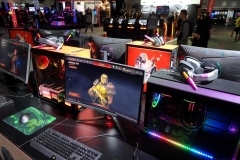 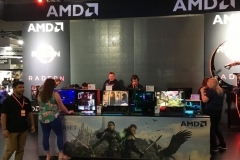 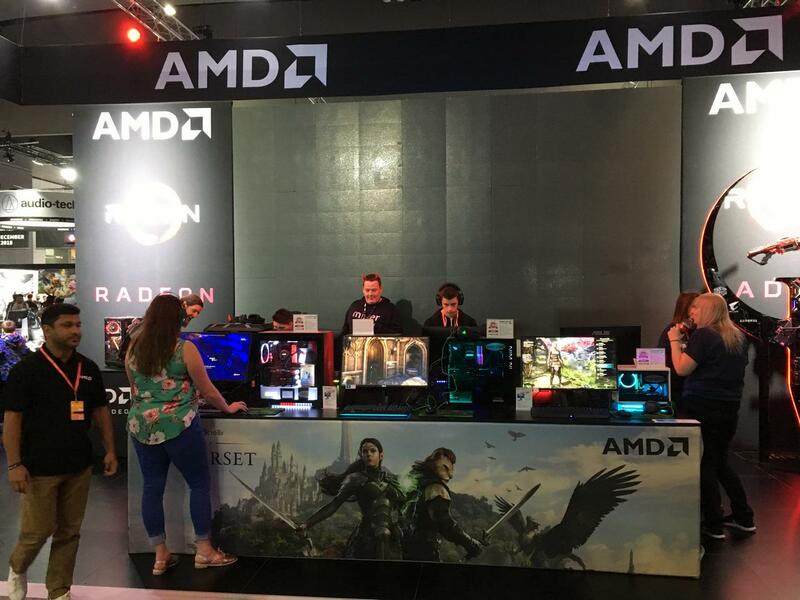 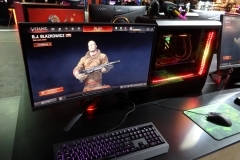 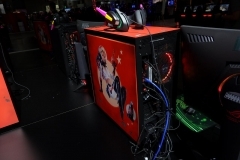 The hardware vendor presence in the PC Gaming space seemed slightly lighter than last year with the focus (generally) seeming to be on the hotly contested gaming peripheral space. 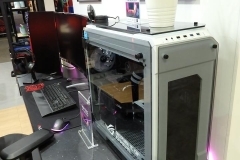 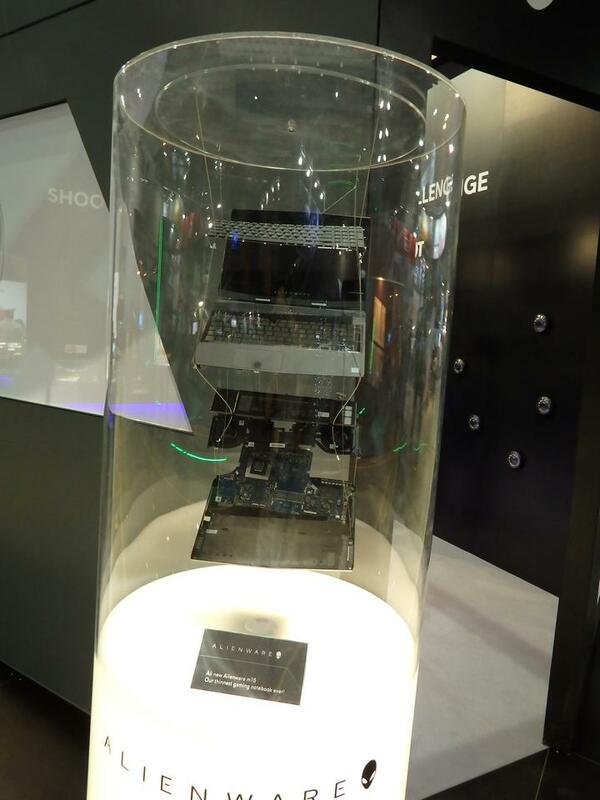 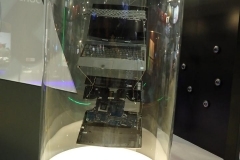 The awesome hands-on overclocking training corner run by HWBOT with Dino last year did not make a return in 2018 – I felt was a real shame for both attendees and Intel but there is always next year. 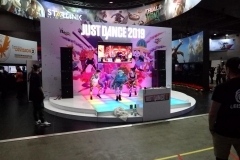 Did these things take away from the experience and hurt the event? 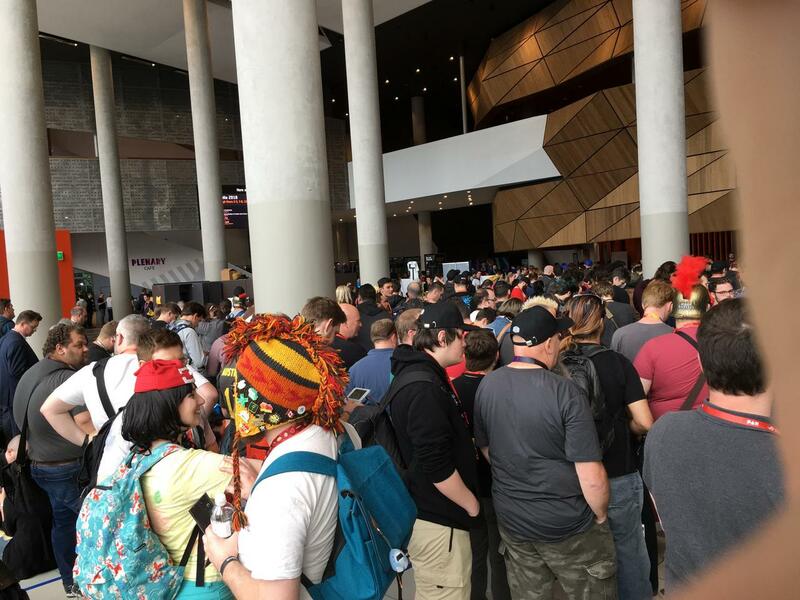 Not at all, the people make this event and the vibe was just as positive as last year. 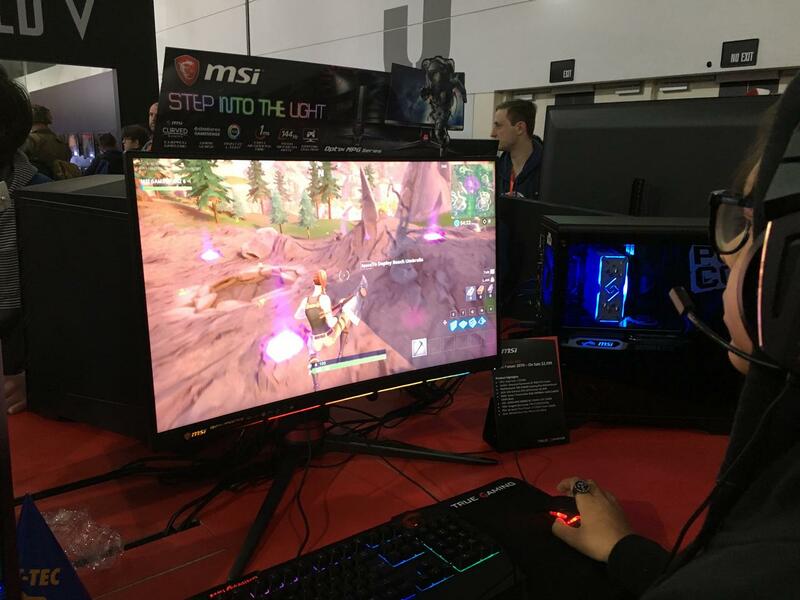 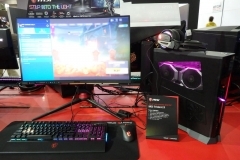 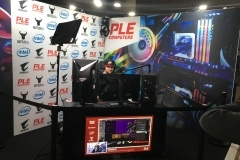 I wanted to give a shout out to Jack from ASUS, Michael from HyperX and Jeremy from MSI – you guys know your products in amazing detail and ran great booths at the event. 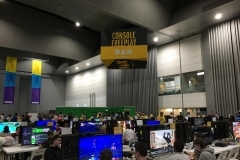 In conclusion, I came away from PAX 2018 knowing a lot more about what’s available on the market for my technology/entertainment needs, I met some new friends, caught up with some old ones and had a great time in the process. 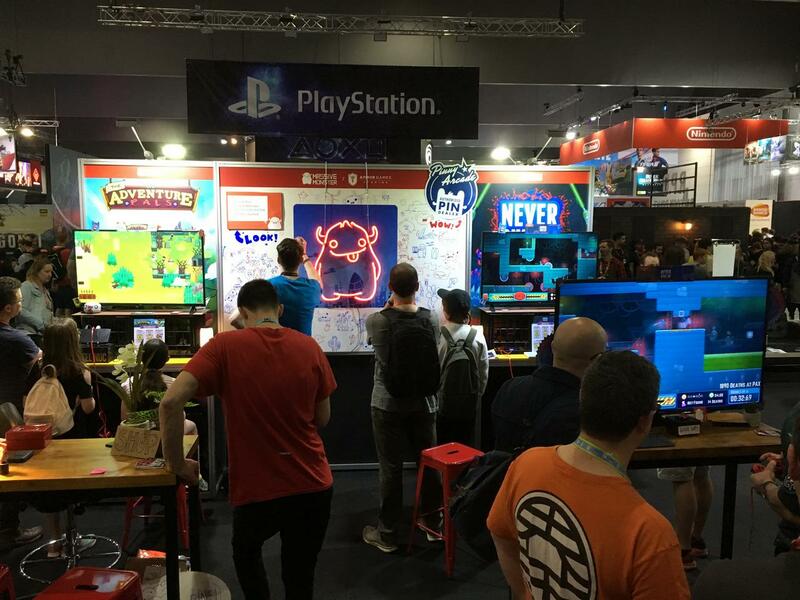 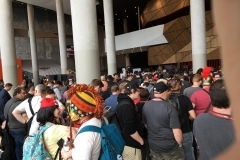 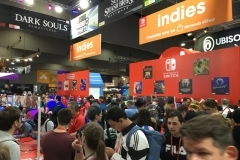 If you have never been to PAX AUS, keep an eye out for tickets to next year’s event – it’s a great weekend and worth visiting, if only for a day, to see what’s new in gaming.